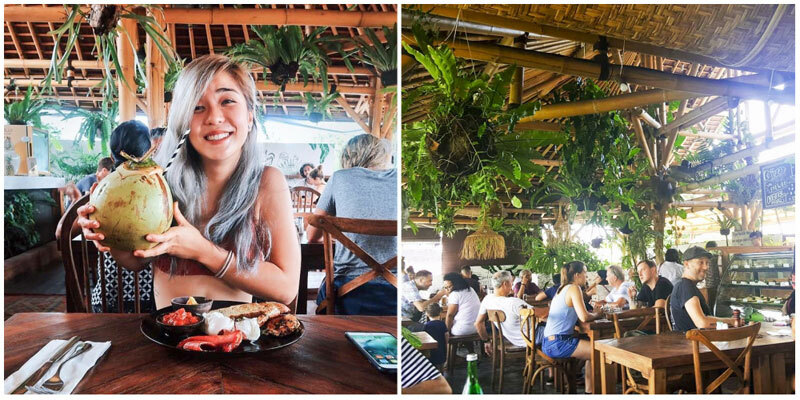 Looking for places to grab a quick bite in Bali before hopping onto your next flight? Or have you arrived after an overnight flight, too early before your hotel check-in time? 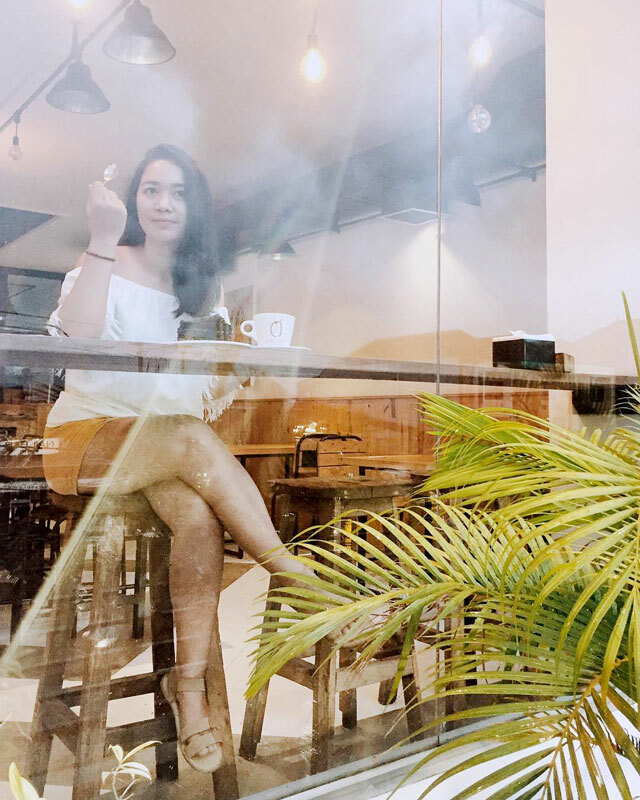 We all know that Bali’s international airport is not the most interesting place to chill at, nor is it the best place to get the most delicious food, so why not hang out at a cosy cafe nearby where you can chill, work or grab a bite (or all three) while waiting? Even better, they are less than 20 minutes away from the international airport by car, so you don’t need to travel too far off! 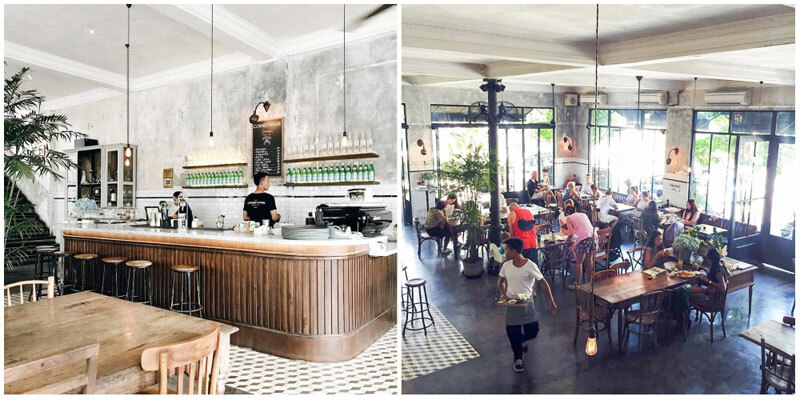 Bali is the ultimate haven for cafe hoppers and digital nomads. 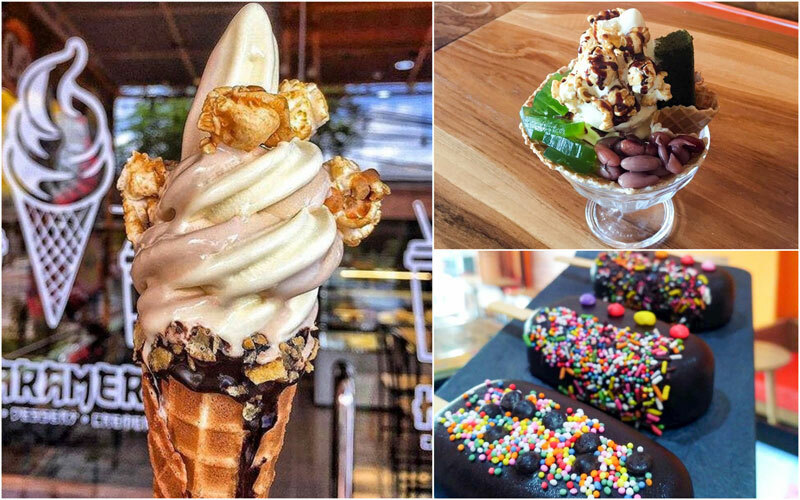 From unique cafes to healthy, organic, vegan food places to exquisite dessert parlours and coffees that are works of art – name it, and you’ll find it here. 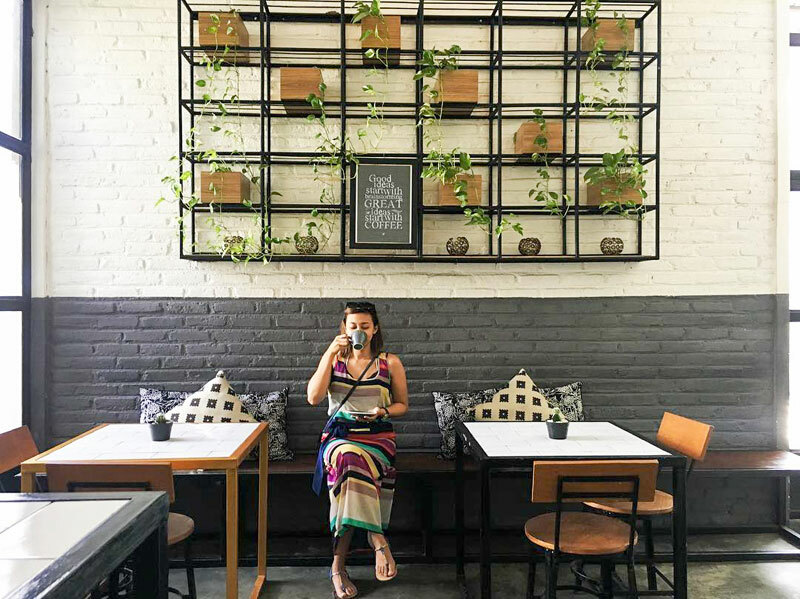 So, to make sure you don’t end up in the wrong place in your limited time in Bali, here are some of our favourite affordable Bali cafes near the airport, where you can chill at while waiting for your flight or your hotel check-in! 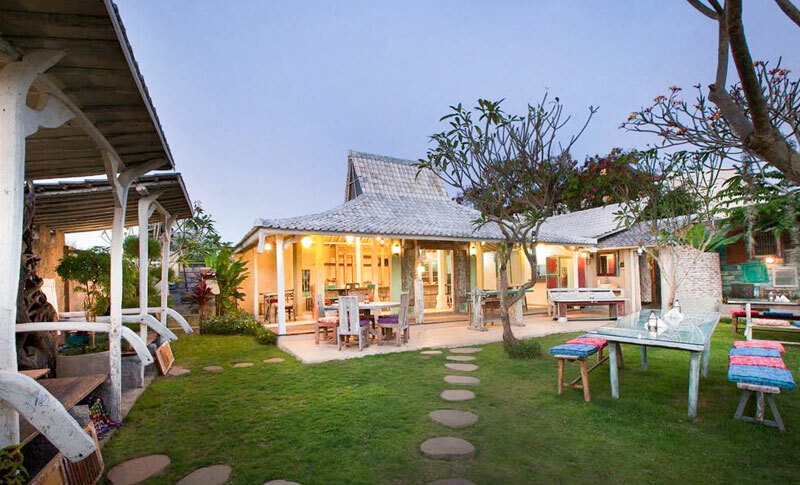 Aquamarine shades, country vibes and springtime feels – that’s what every day at Lada Putih looks like. 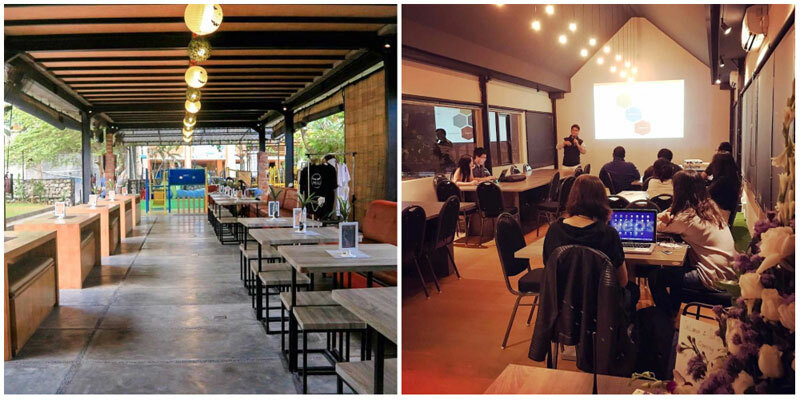 The simple yet beautiful cafe-style restaurant serves up quite a storm of Asian dishes and freshly made juices. But the gorgeous garden seating seals the deal for a good picnic-style outdoor lunch! The Wagyu steaks and chicken steaks are so amazing and perfect for a relaxing picnic. 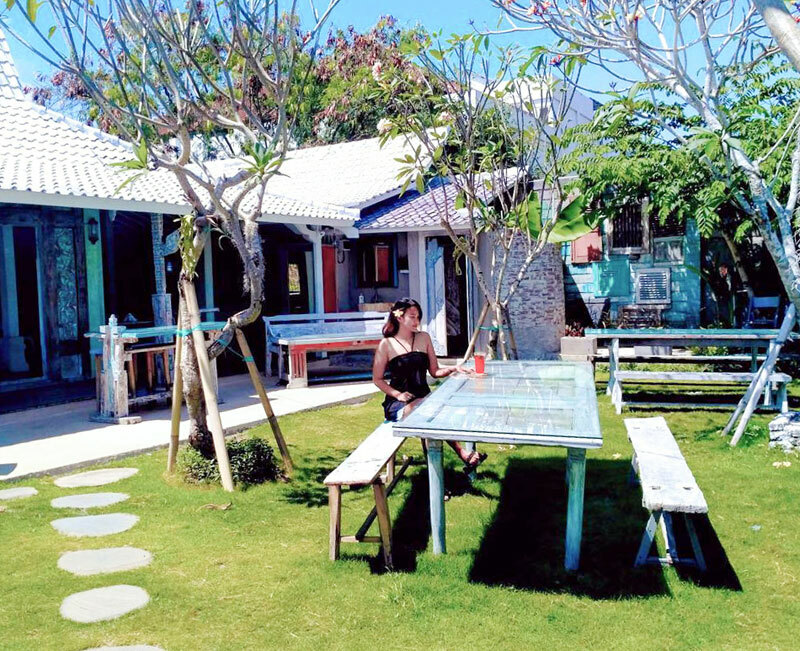 Leave behind the jetlag and unwind under the shades of flowering trees and dine on rustic wooden benches. Revel in the sunny days and lanterned nights in the great outdoors. 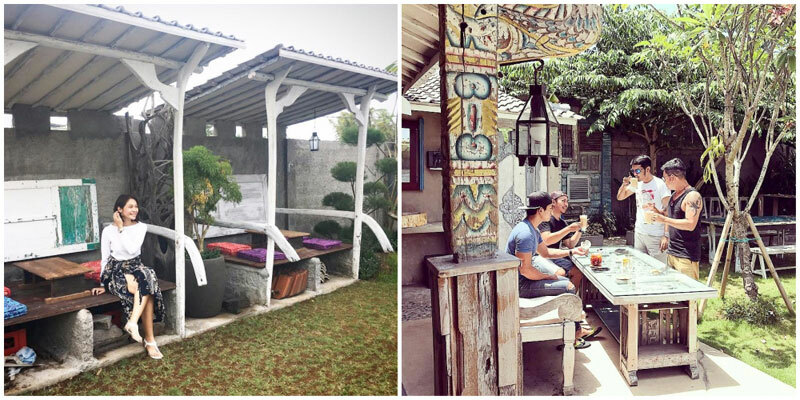 If you’re not a fan of outdoor seating, the interior is welcoming enough with beautiful wall art and contemporary Balinese architecture. Locating the little place can be somewhat tricky, but the warm feel and hearty meals are so worth it! 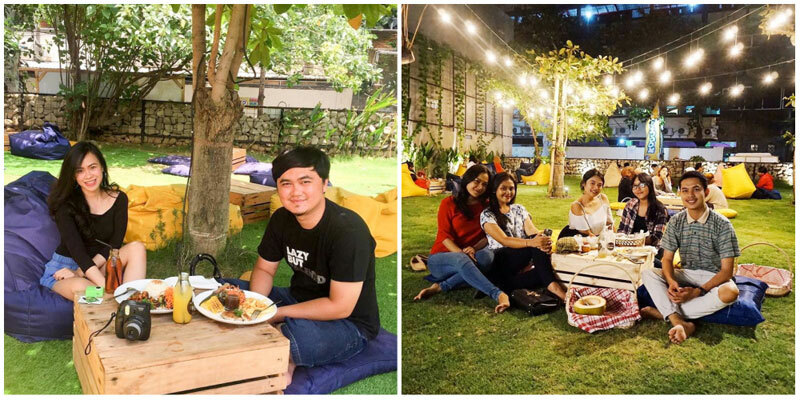 Going on a picnic on a work day seems like a dream, and it is one that only Nightmarket Cafe can bring to life! 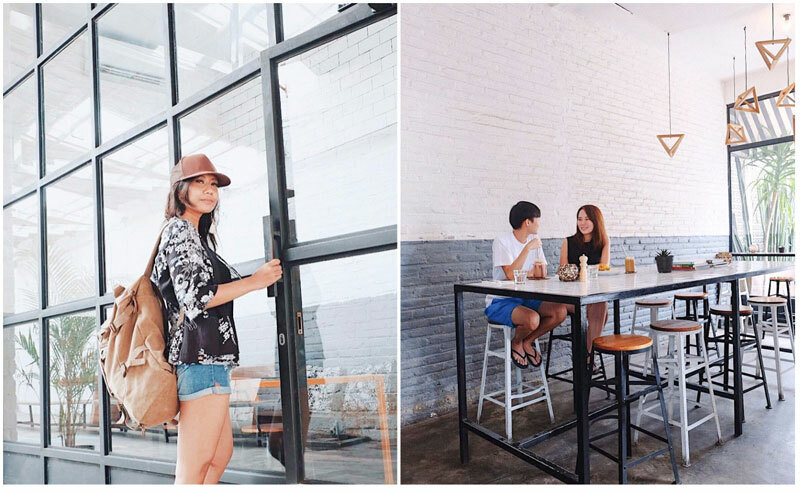 If you are a digital nomad swishing past Bali, this is one place you just can’t afford to miss. 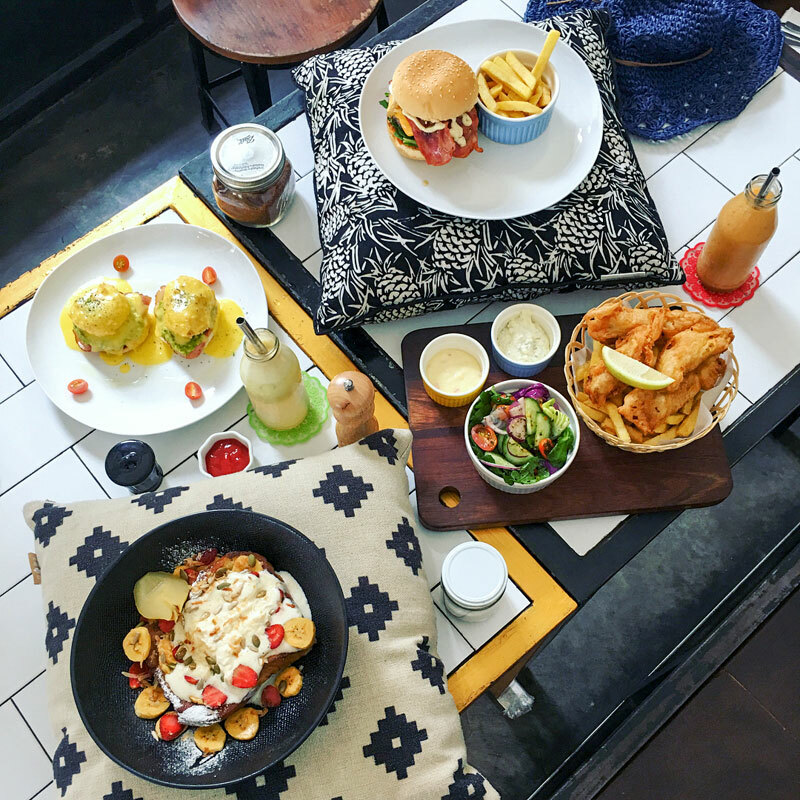 Laze around in bean bags, grab picnic-style lunches and Special Night Market Beverages. 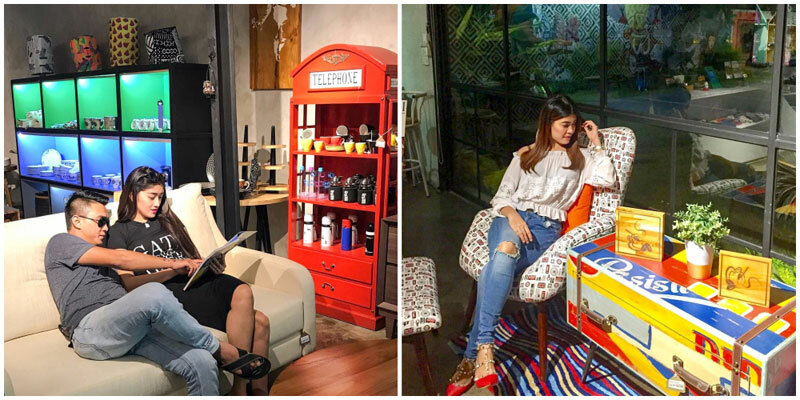 You can even catch up on your deadlines at the cafe’s own co-working space, which comes equipped with all the amenities you need for a super-productive day at work. What better way to get the creative juices flowing? Food, of course. The non-alcoholic drinks are one of a kind, and the fish and chips are as good as the ones you can grab on London streets. Psst – the Green Tea Latte is a unusual brew that you shouldn’t leave without trying! 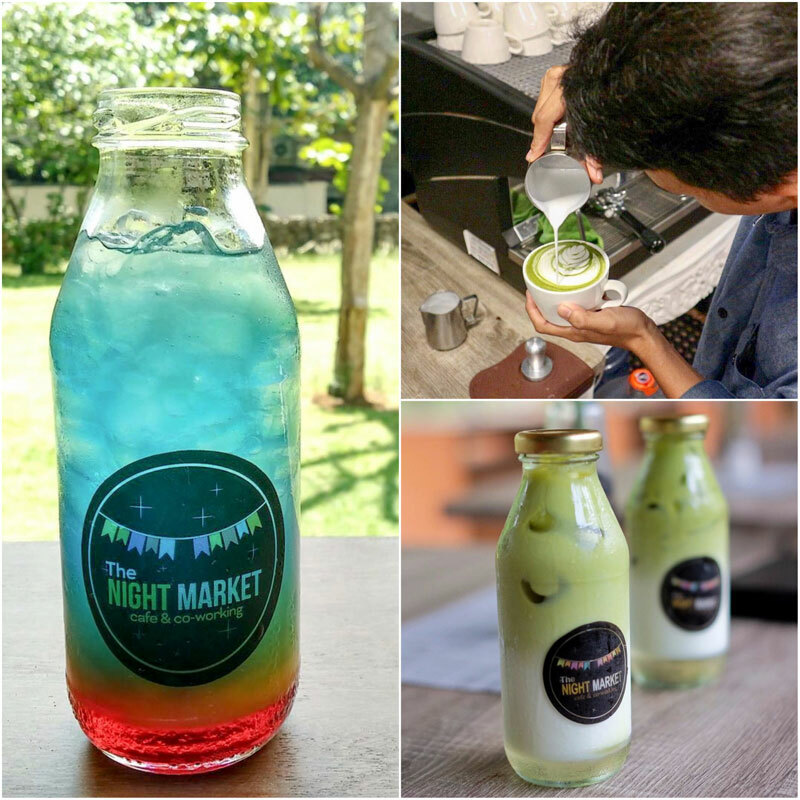 Come nightfall, the bright park-style cafe turns into a buzzing night spot under the open sky and starry lights! So come with some time on hand and spend a happy, productive yet laidback day – we don’t know how that sounds possible, but it is now. Does just hearing the word “shopping” make you happy? 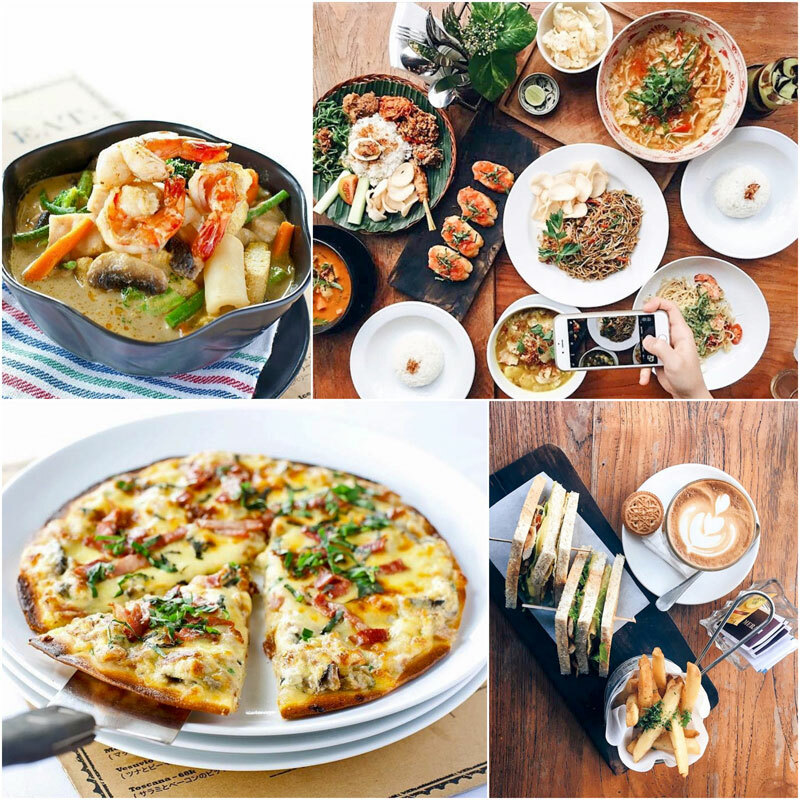 Cafe hopping and a bit of retail therapy – that’s all you need to shed the fatigue from a long flight! 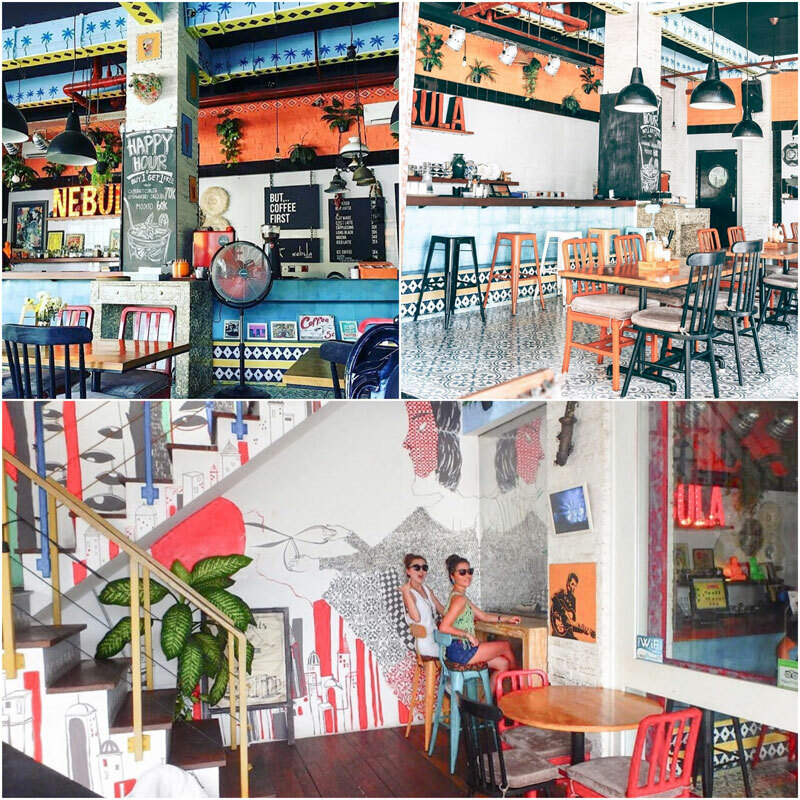 And Rumahan Bistro’s bright interiors work wonders to perk up the mood too. 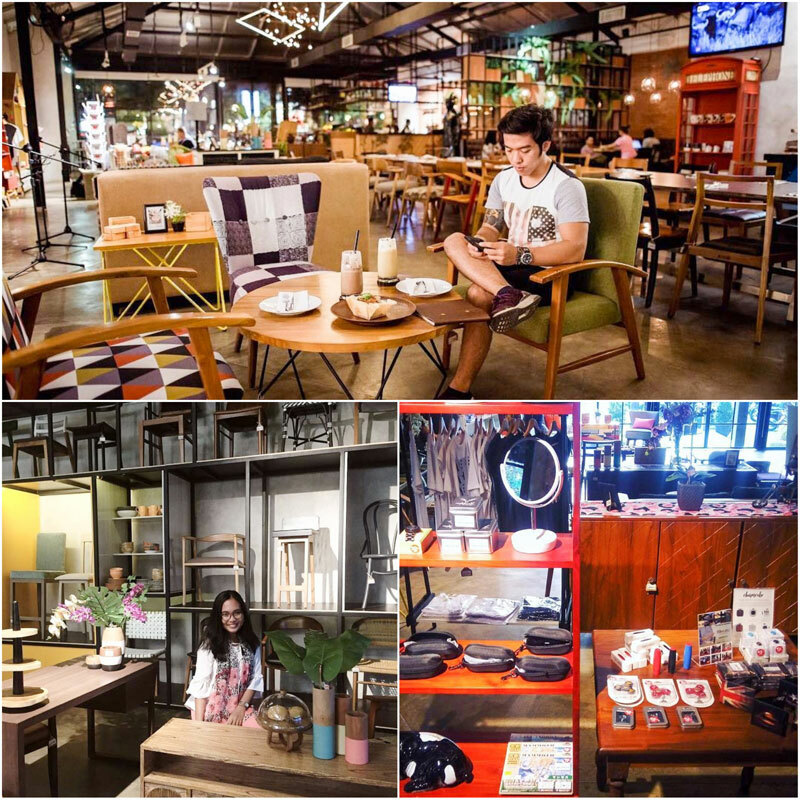 Here’s a mix of a cafe and a home living store, where you can relax with a signature drink (we’ve heard the Tjin-Tjau is awesome) and also release some endorphins by shopping for some quirky table tops off their shelf. 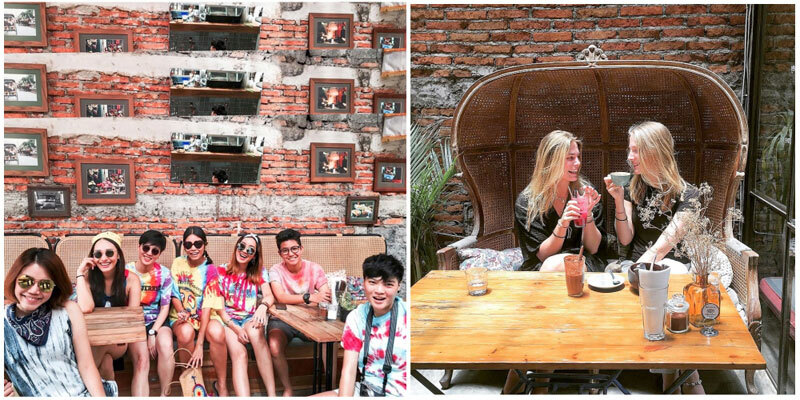 Your pictures would turn out to be so much fun, in the sprawling cafe full of interesting wall murals and pop colour. Did we mention there’s a life-size bicycle mural on one of the walls? How cool is that! 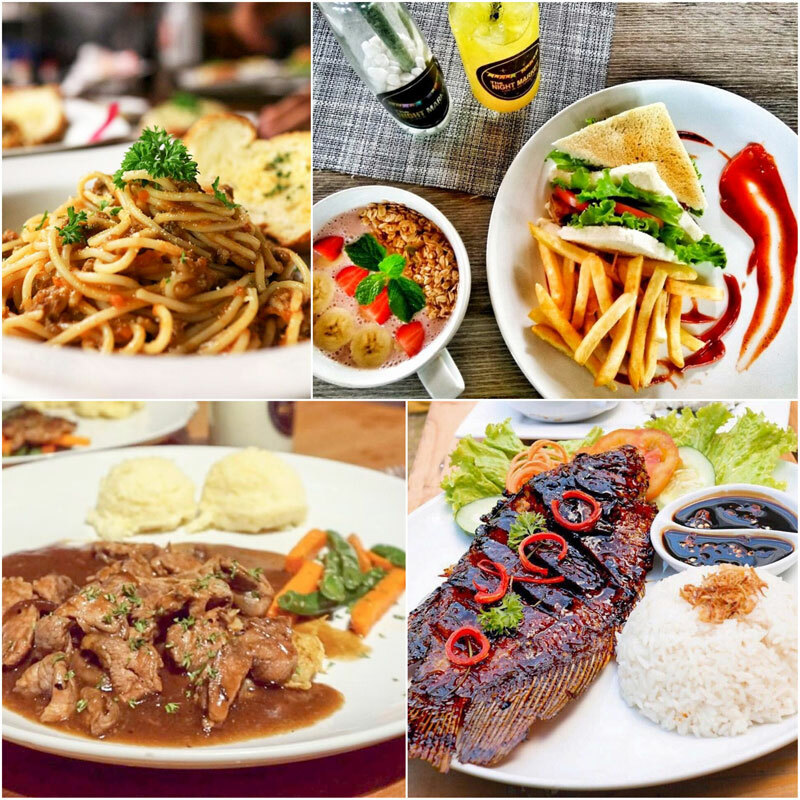 The menu lives up to its mix-and-match reputation too – there’s Asian, Indonesian and even Western cuisine to choose from! Lamb lovers are in luck, for the lamb dishes are the highlight! Try the lamb biryani or the lamb shanks. 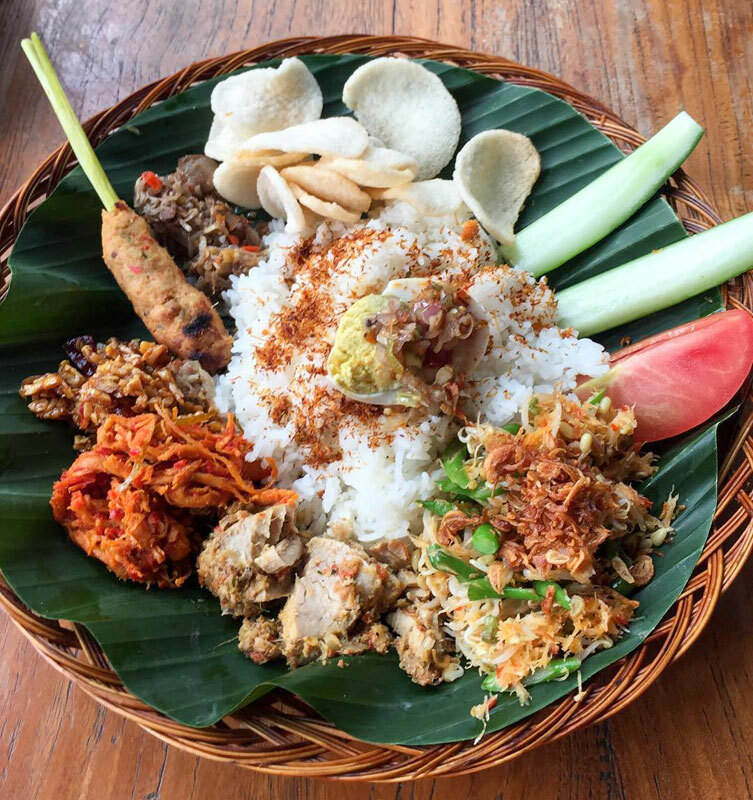 We’re not forgetting the lovers of local cuisine too – nasi campur and nasi goreng are favourites out of the Indonesian options. 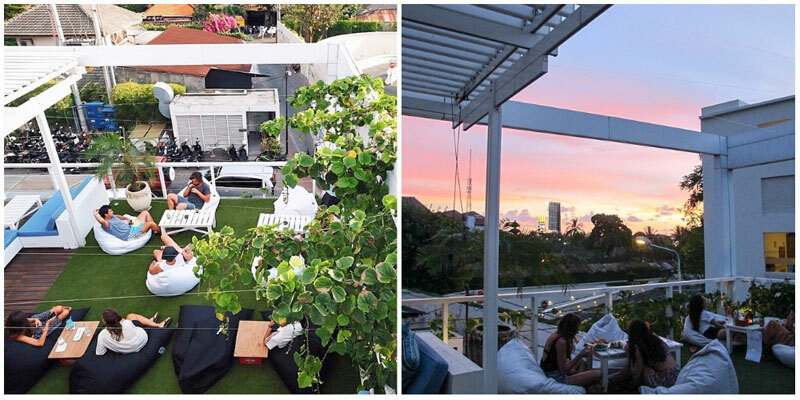 The Shelter is a rooftop garden cafe with a beautiful view – a secret escape from the busy streets of Seminyak. 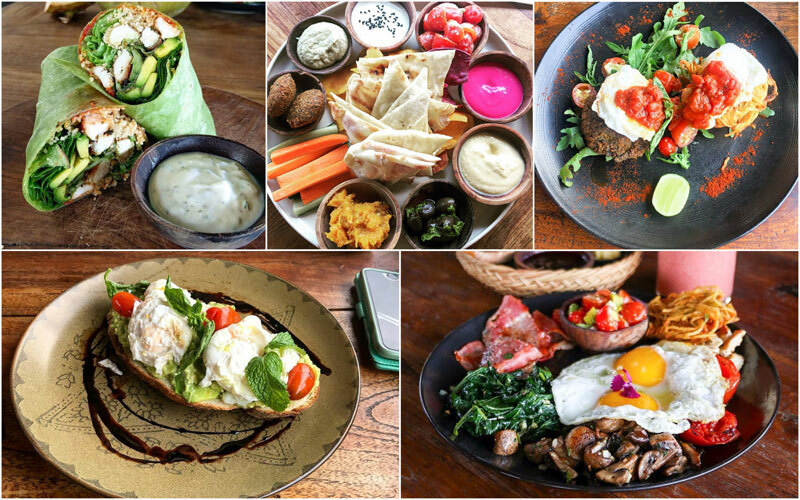 They have some vegetarian and vegan options on their menu, which include locally-sourced free-range eggs and organically produced food. The Veggie Burger Wrap is to die for. If picky about food on the menu, you’ve come to the right place. At The Shelter, you can design your own breakfast and fresh juice! 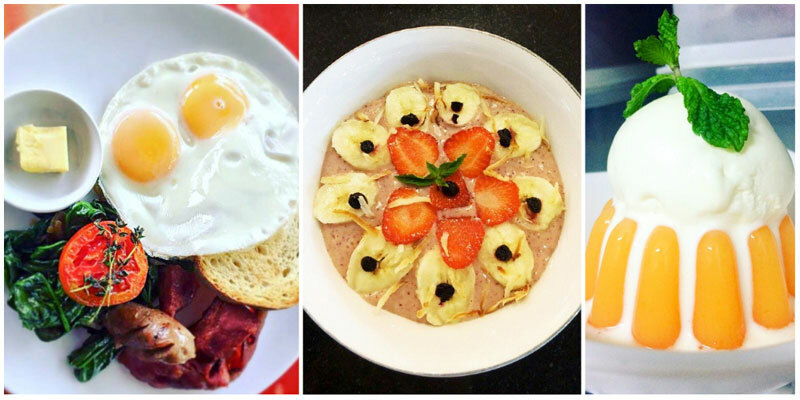 So give your creativity free rein and make a breakfast of your dreams! Sharing is caring! You can try a snack plate and share it with your friend. There’s beetroot feta whip, homemade falafel and tahini whip or spiced roast pumpkin puree! And don’t forget some sweet treats for those who love raw food – Rawsome Cheesecake or Raw Energy Balls. You will love the inspiring quotes on the walls too! 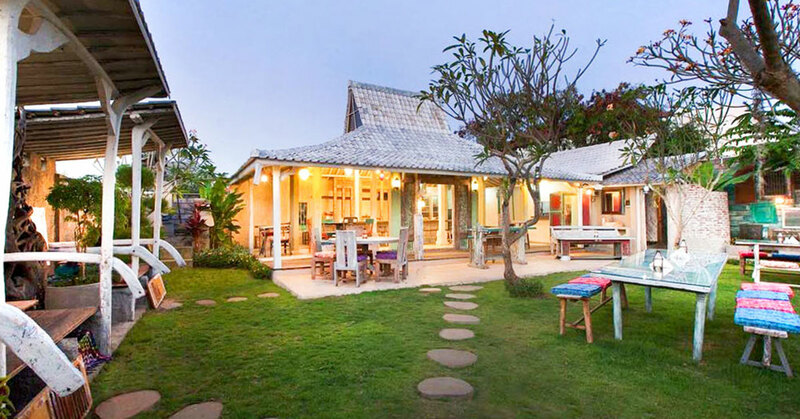 Touchdown directly at Kafe Batan Waru – just 5 minutes away from the Denpasar International Airport by car. 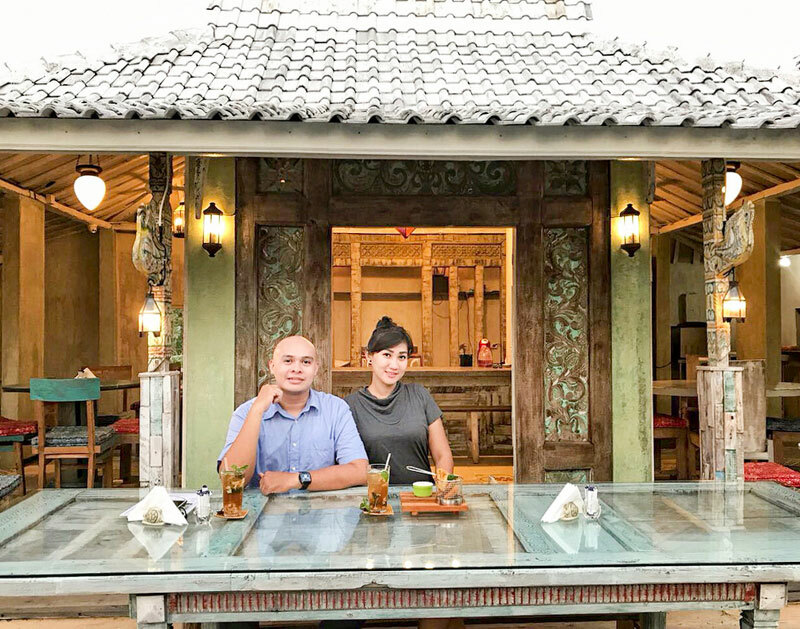 This is a delightful cafe and restaurant that should be the first on your list if you are looking to try out some authentic Indonesian delicacies. 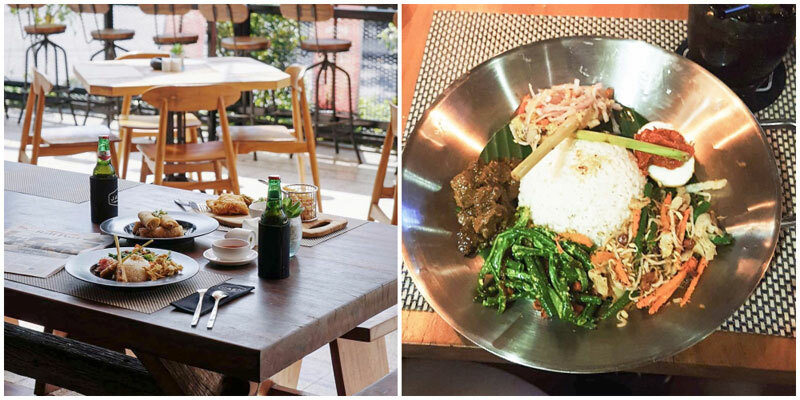 Enjoy a lunch under bright lamps, in a hip traditional-meets-modern interior. And if you plan to spend a laidback evening here too, the cocktails will keep you company. 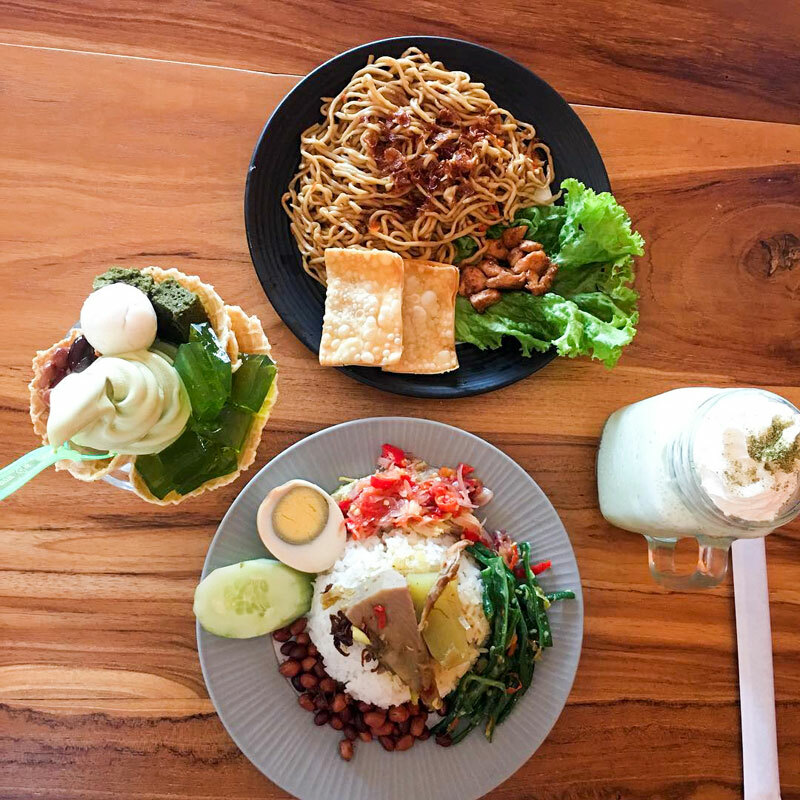 The health conscious ones out there can relax and rest assured, because the restaurant is known for its super fresh ingredients sourced directly from local farms. Don’t forget to try their local favourites and main courses. We’ve heard that the Nasi Campur is quite close to being out of this world. So pocket friendly too! Imagine a library, but only for coffee! 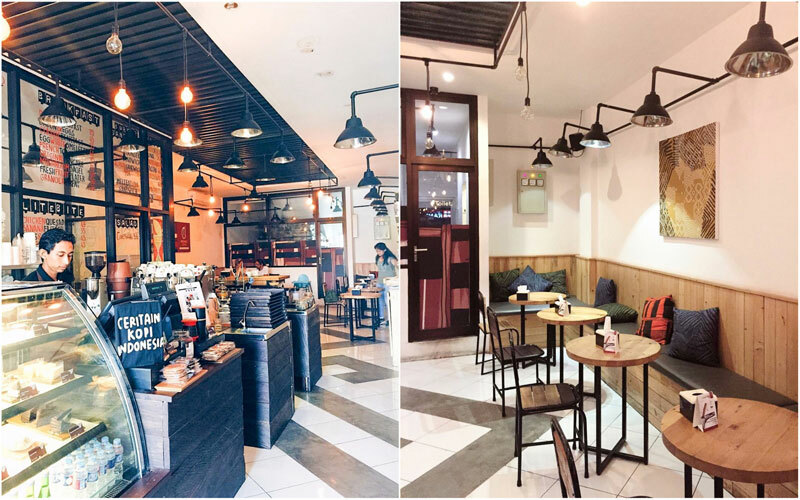 The freshly brewed concept of this cafe brings freshly roasted coffee beans from all around Indonesia under one roof (hence the name). 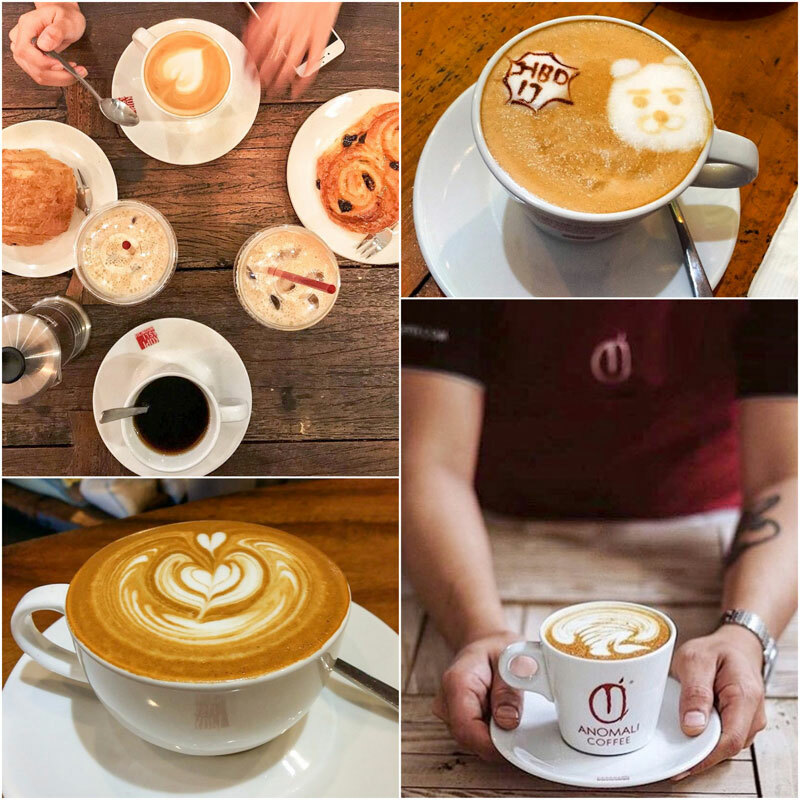 So, if you are a true coffee aficionado, you now know where to head to! Along with hot favourites like Luwak coffee beans, you can indulge in most of the most well-known beans around the world as well. Still in doubt? Just go for the Library Blended Coffee, and you won’t be disappointed. But even though coffee is clearly the king here, the food doesn’t lag too far behind (there is some awesome seafood available), and you can also enjoy some great cocktails. Afternoons at the cafe are as quiet as it gets at a library, so that’s the time to go if you are looking for some solitude and solo coffee dates. Just a 19-minute ride from the airport can transport you back in time to a bygone European era! 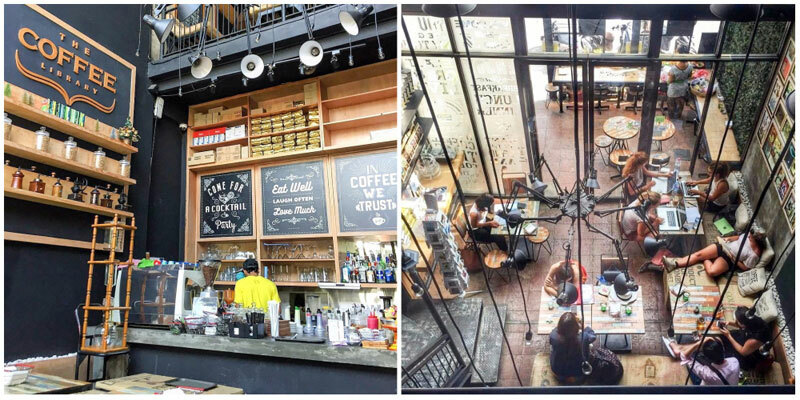 The vibe is strong at the Cornerhouse Cafe with its vintage feel, industrial decor and grungy ambience. There are so many spots to take great shots inside the cafe (the sprawling staircase leading up to the bar is one of our favourites!). When the weather is good, you can also chill outdoors at the little garden courtyard and grab a smoke. 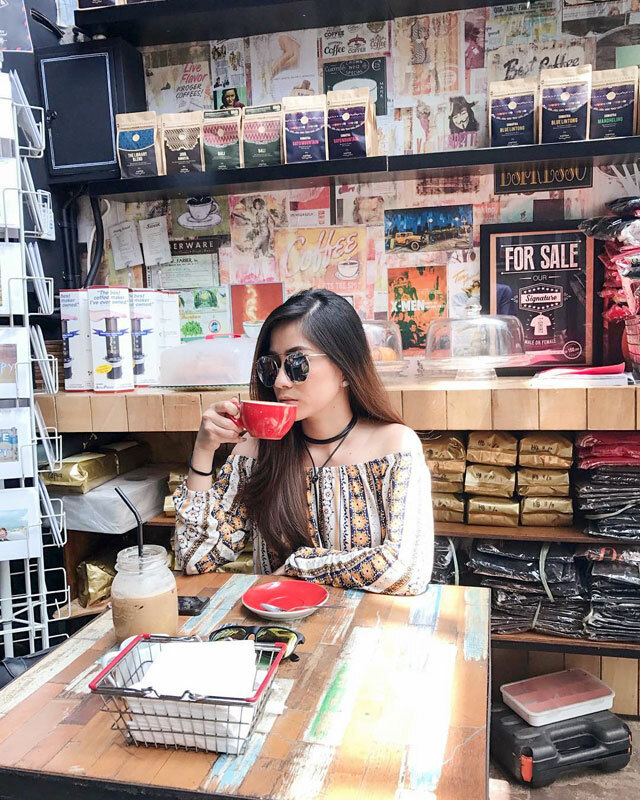 The coffee here is sourced from Bali’s famous Revolver cafe, and you can’t go wrong with that – of course, they are crazy good! 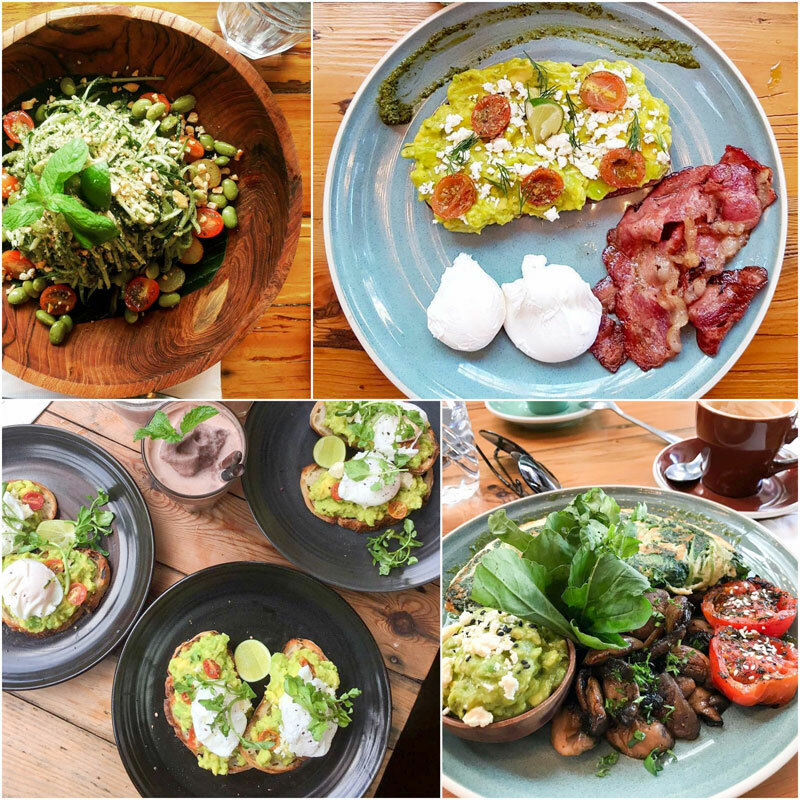 Breakfast time is busy and for good reason – the breakfast menu comes highly recommended (with HUGE portions and full-on flavour). 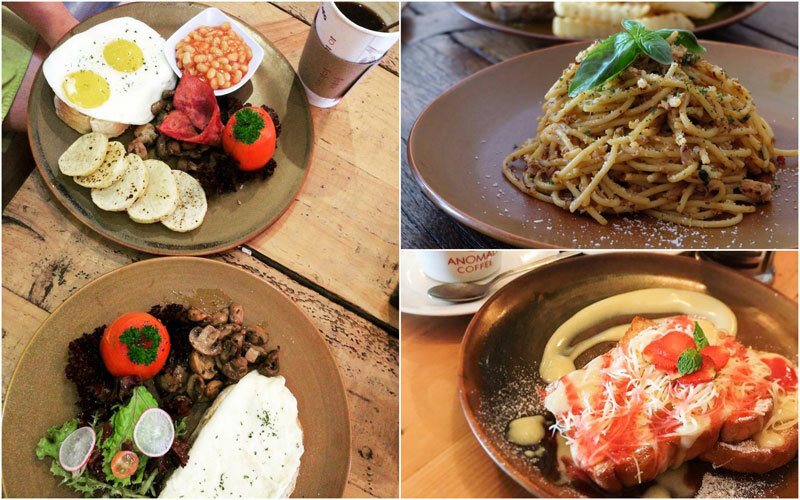 The Cornerhouse big breakfast combo is sure to bring out the glutton in the best of us. 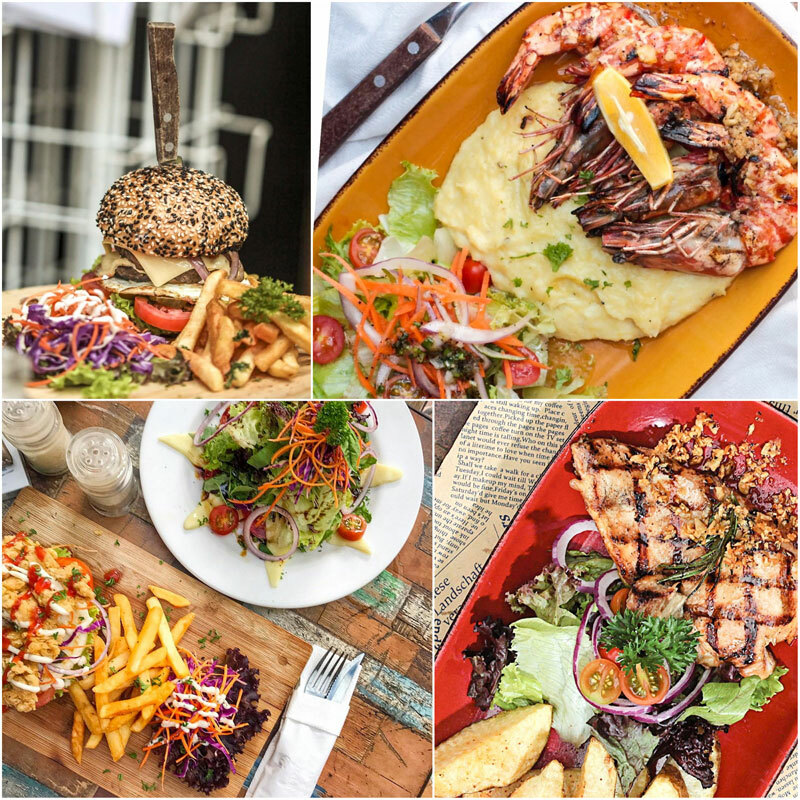 You’re spoilt for choice when it comes to the menu – from Antipodean and European favourites to all things tempting and gourmet. So, when in doubt, go for the sumptuous Cornerhouse burgers, for those will never disappoint! The salads look gorgeous and we can totally vouch for the Toasted Ciabatta with sourdough topped with avocado smash. Munch away – just be sure to make it back in time for your next flight! 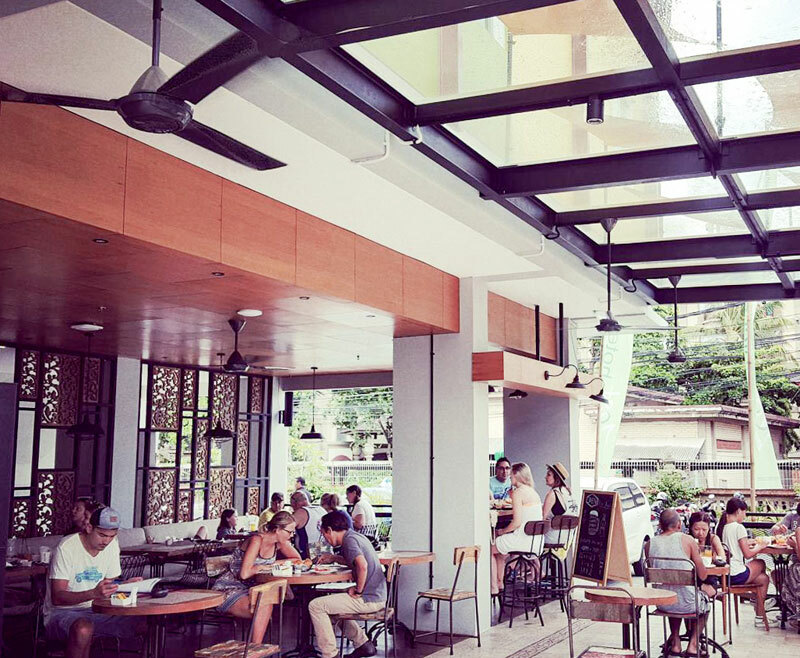 Duck into this cozy cafe with a tropical setting and spend a lazy evening just people watching! 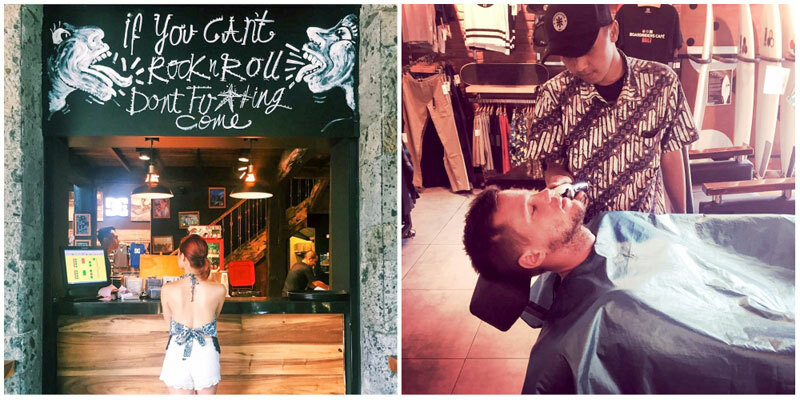 Grab a seat on the sidewalks of touristy Bali and its shopping hotspots. You can get a hang of the streetside vibe at the outdoor seating area that is brimming with energy. 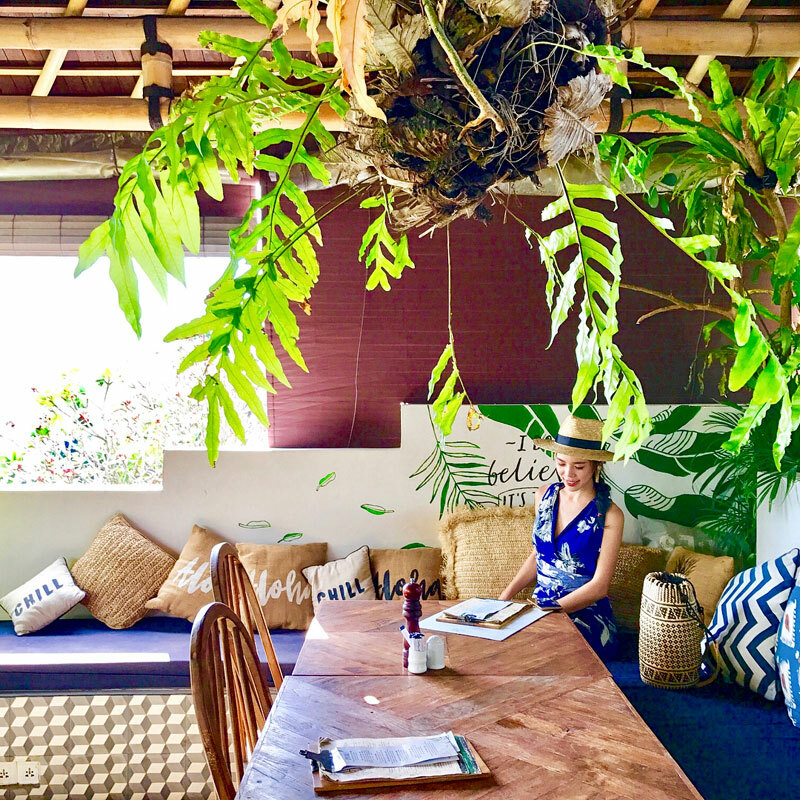 Or, you could enjoy a different kind of vibe inside, where the atmosphere is much calmer (and cooler, thanks to the air conditioning) – let the tropical decor and abundance of greenery lift up your spirits. Speaking of spirits, drinks flow in streams and are pocket-friendly with the happy hour deals! 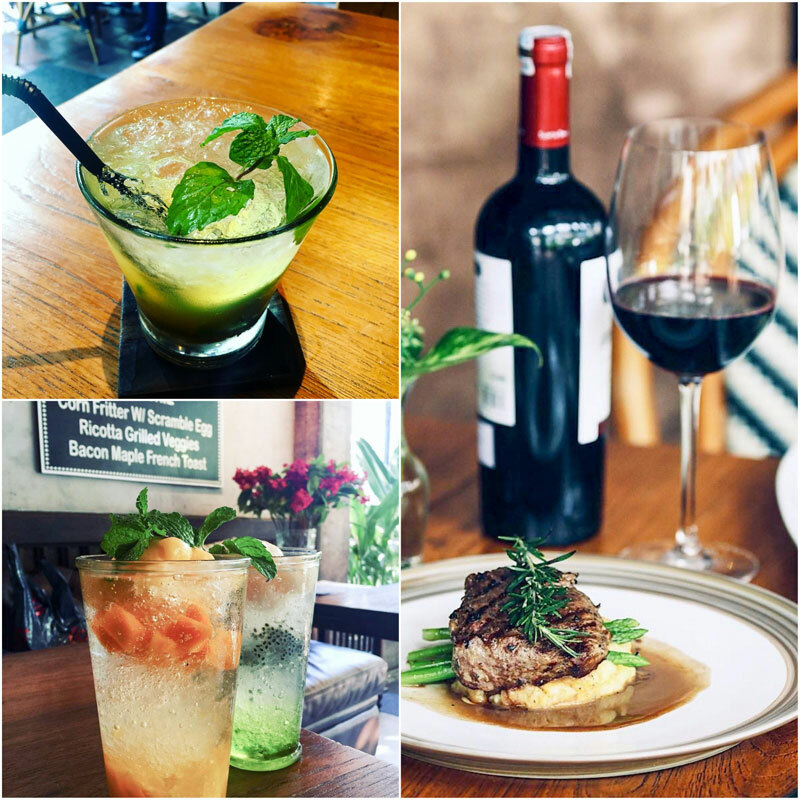 The array of wines are oh so tempting, that it will instantly get you singing “summer wine” in your mind. The fusion food is absolutely finger licking good. 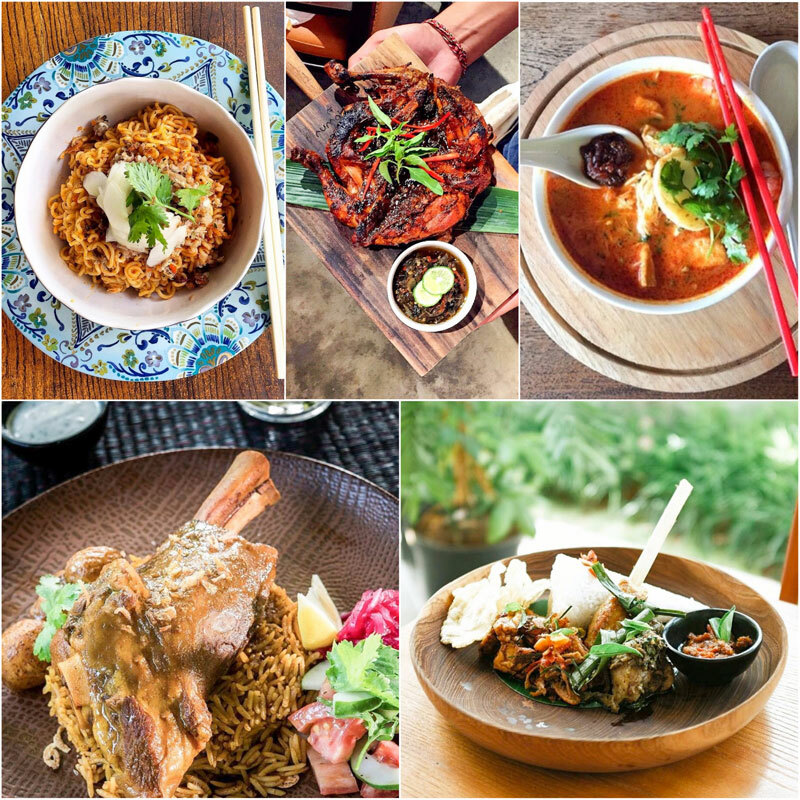 Go for the Nasi Goreng, we’ve heard it’s one of the best in town! There’re no frills here, only pure good coffee, brewed to perfection and served in a homely setting. If you’re a coffee addict looking for strong, rich, and aromatic coffee – drop by Anomali Coffee with your eyes closed. 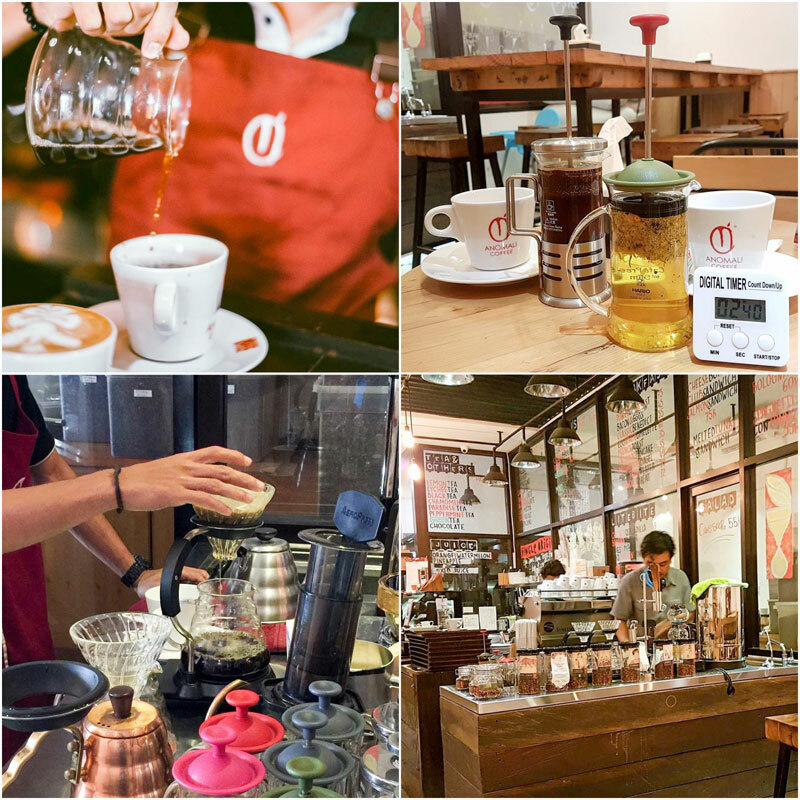 True coffee enthusiasts swear by the coffees here! Get a trip out of getting your coffee tailormade to perfection. Pitch in on the coffee making process, get it dripped or french pressed or just plain simple from the espresso machine. You can even pick your own fresh beans from a bunch of options available! Just ask the friendly staff if you are unsure or just starting out on being a coffee snob. Word of caution for the digital nomads – the wifi isn’t the best thing here. So come for the great coffees and some alone time on a coffee date, but don’t expect to be catching up on work any time soon. 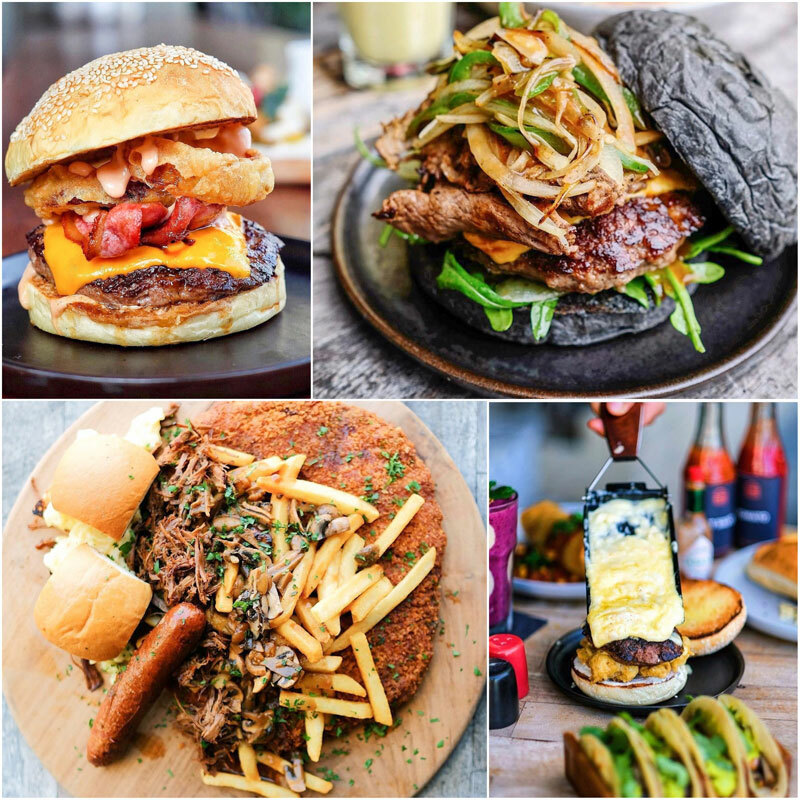 Discover the best burgers in town at this outlandish cafe in Kuta. 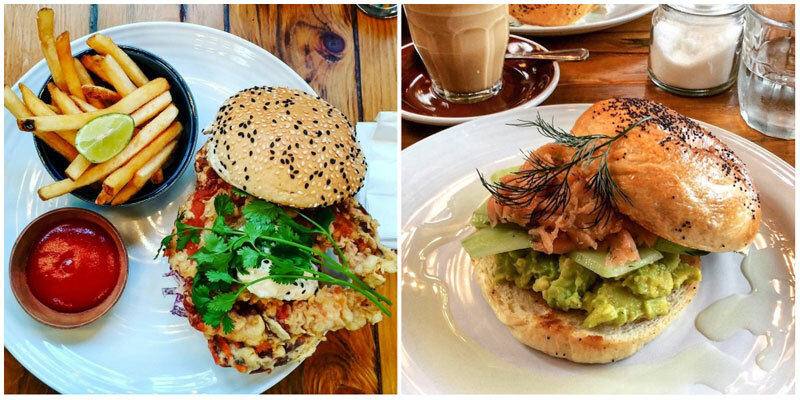 Their burgers are a work of art – the Beyonce of burgers! Have some of their impressive European samplings, paired with juices that are good and as fresh as they get. Want a Pina Colada, anyone? 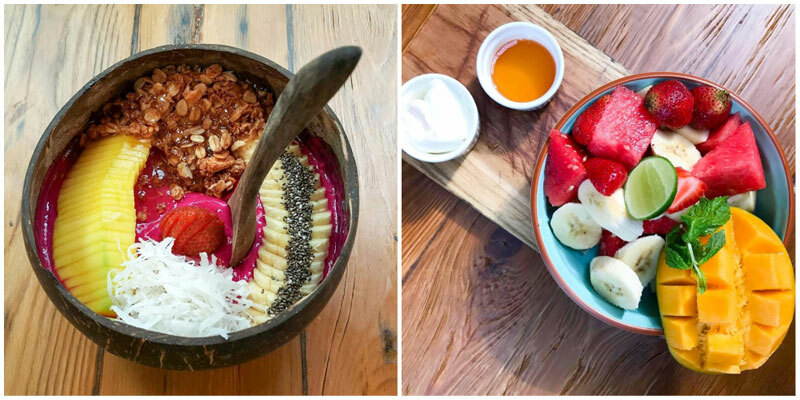 If you are here for brunch or breakfast, get your hands on one of the smoothie bowls! 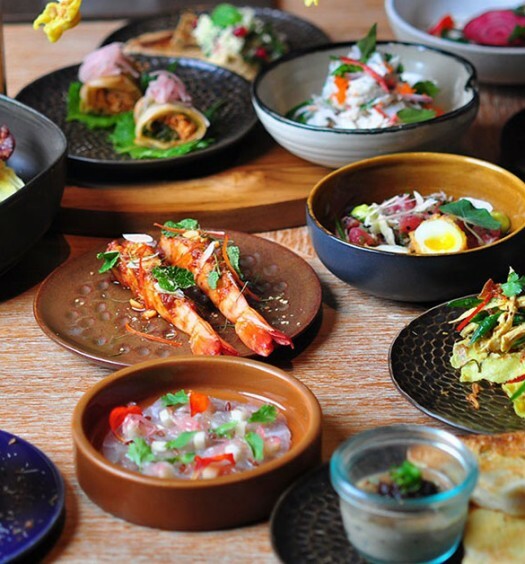 We cannot place our finger exactly on the ambience, which shifts between Indonesian and subtle South American, complete with a hint of the rock and roll – maybe, it’s the eclectic mix of it all that makes this place so awesome! 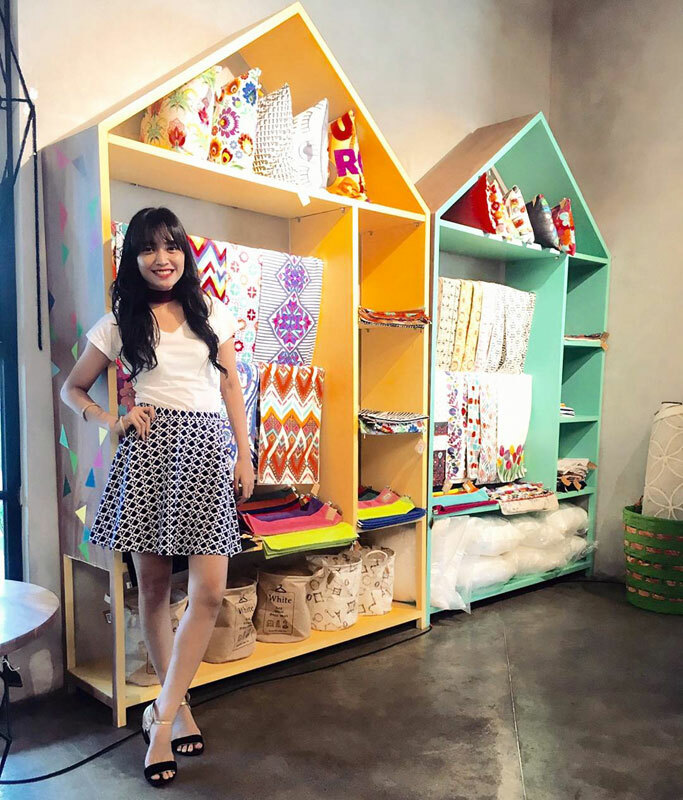 Days are bright and bubbly in this colourful cafe. 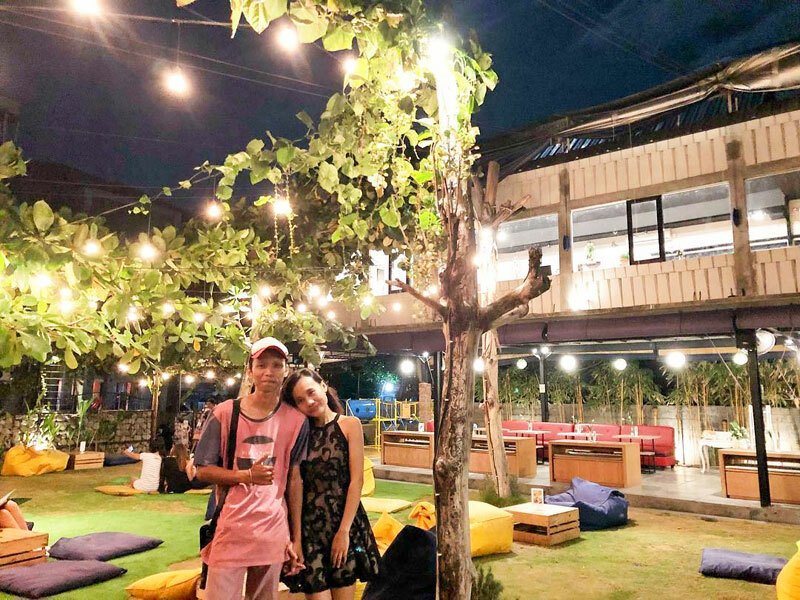 Sink into the comfy bean bags and treat yourself to a splendid sunset on the rooftop before the neon lights take over after dark! Got a few hours to kill? If you are in luck, you might just land here on one of the free movie screening or live show days! Watch some of your favourite movies and TV shows (even the latest season of Game of Thrones), in the flamboyant rooftop space. 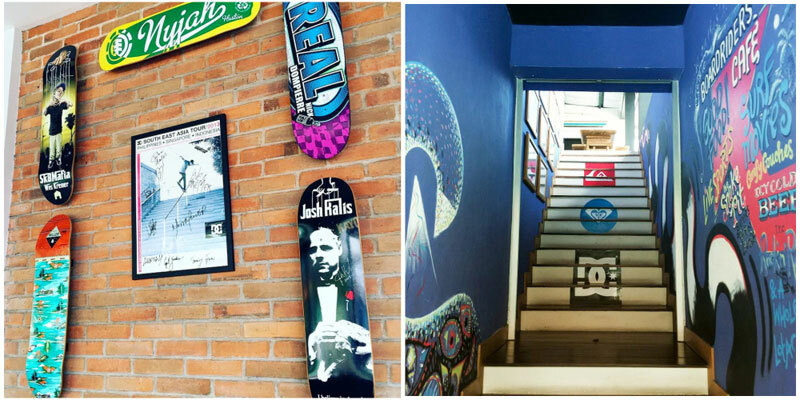 The vibe is vibrant and the crowd friendly – what else is there to want? Just come, chill out, and have a great time. Tropical, industrial, and artsy – all rolled into one? The ambience at Elgin Avenue is the coolest of all! Swing in through the glass doors into a tiny but tastefully done space. 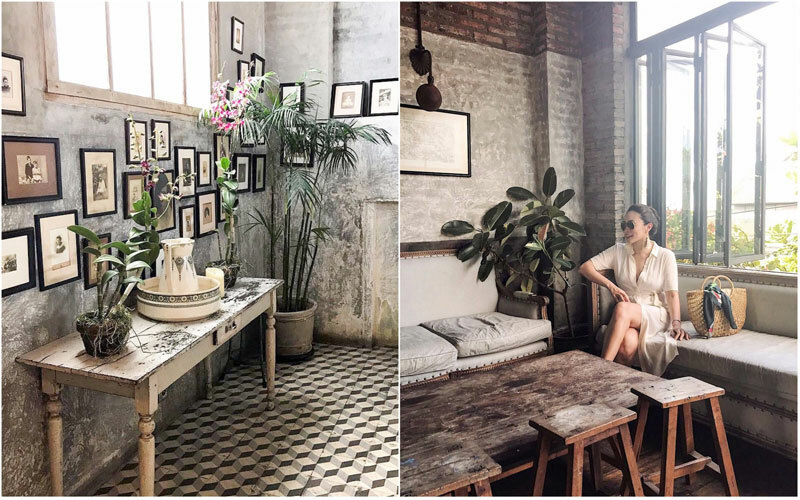 From Paris Metro-style tiled walls to wooden chairs, industrial highlights and a touch of green, everything blends together to give the interiors a look like a modish studio set! Add elegantly plated dishes that look totally gourmet but come at such cheap prices – and you’ve got an absolutely picture perfect scene! 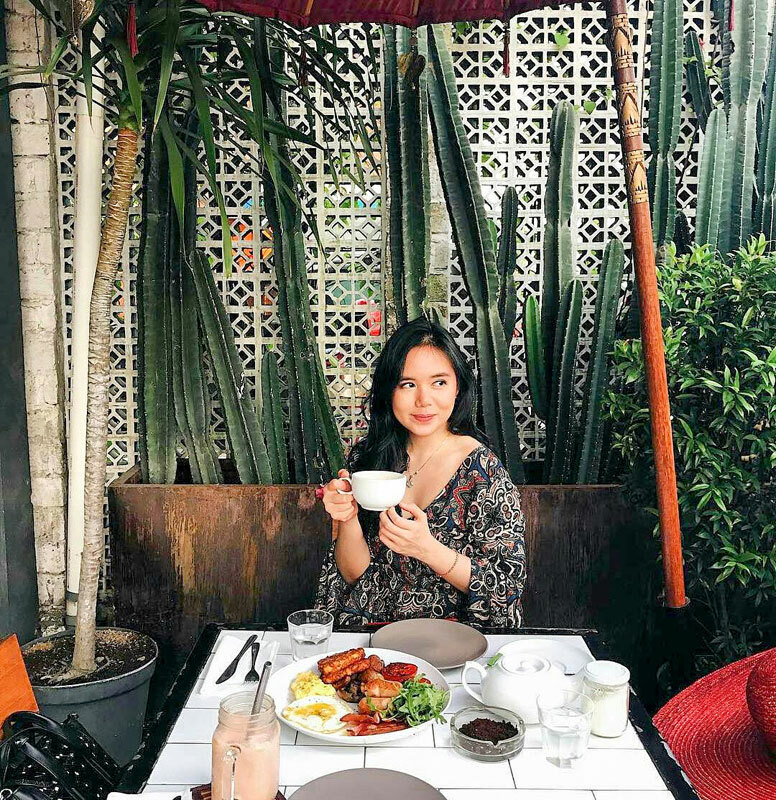 Big breakfasts and brunch sounds like a perfect plan. 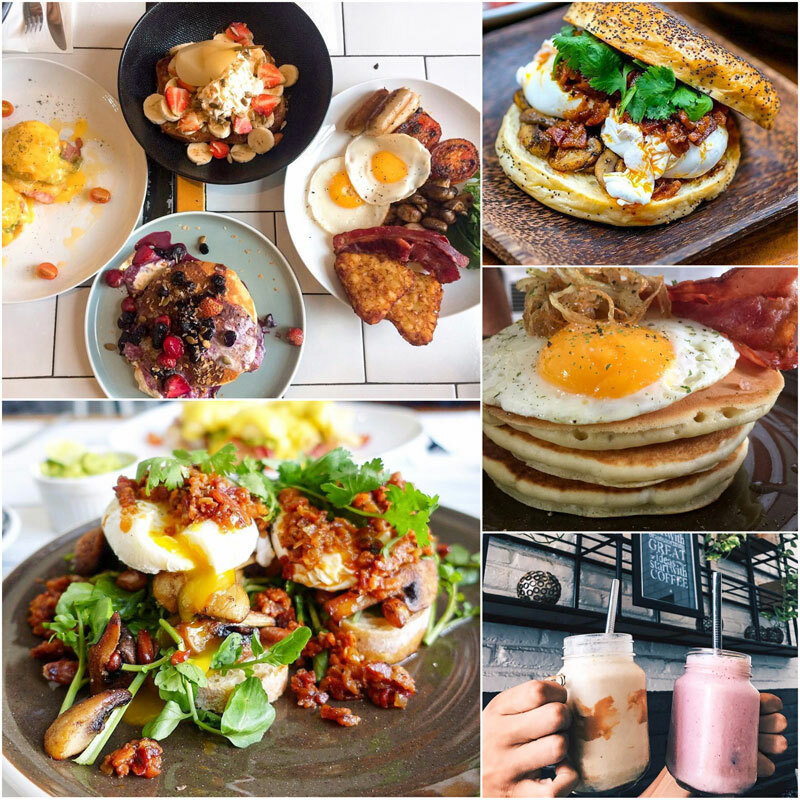 The big portions are a dead ringer of the yummy dishes at suave Aussie cafes, and the egg benedicts (actually anything egg-y) are highly recommended. You’ll fall in love with the bagels, the french toast, and definitely the juices! 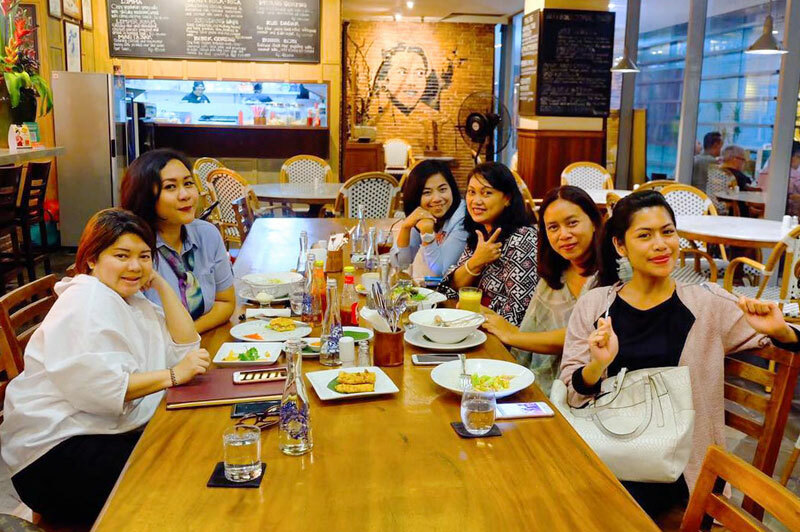 Easygoing owners and staff keep up the friendly vibe of the cozy place. 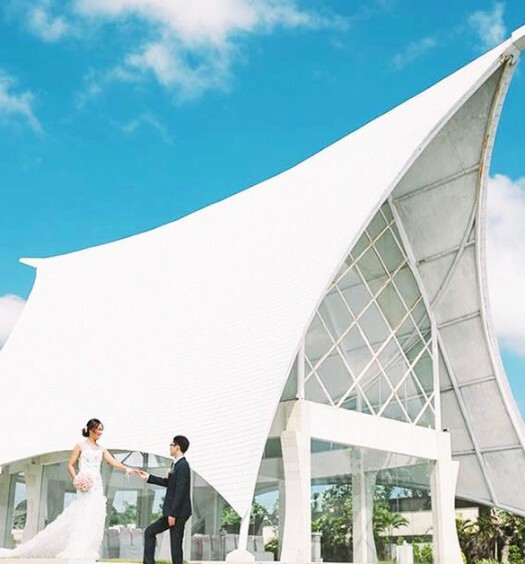 Take a few shots everywhere and you’re all set to get Insta-famous, because there’s no better perfect setting! All’s great, it’s just the super early 5pm closing time that makes us a little sad. But you could always come again, and again, and again. They say the best things come in little packages. 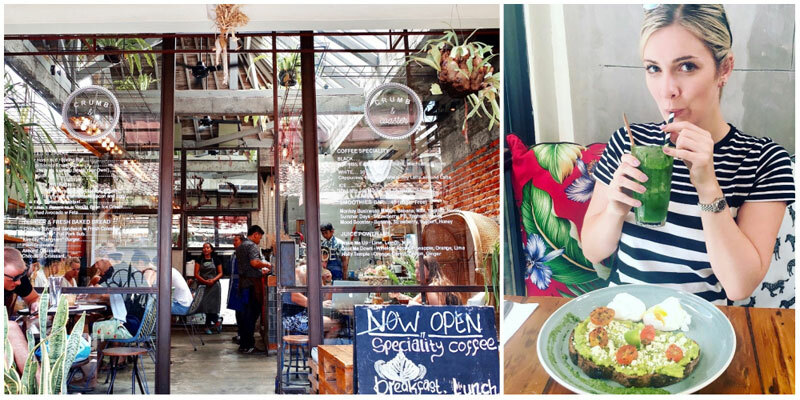 Discover this cute little cafe just a few minutes away from the airport, where a little dessert goes a long way! Kyarameru in Japanese translates to “Caramel”, and it definitely stays true to its name – their caramel desserts are to-die-for. 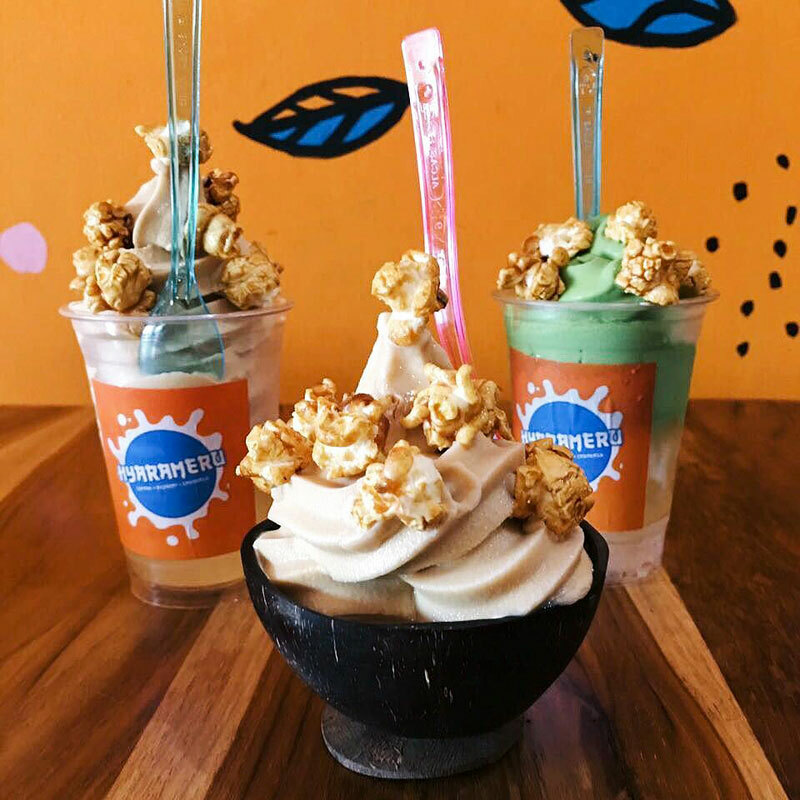 Dig into the soft and silky caramel ice-cream and load it up with popcorn and green tea pops, along with all of your favourite toppings. 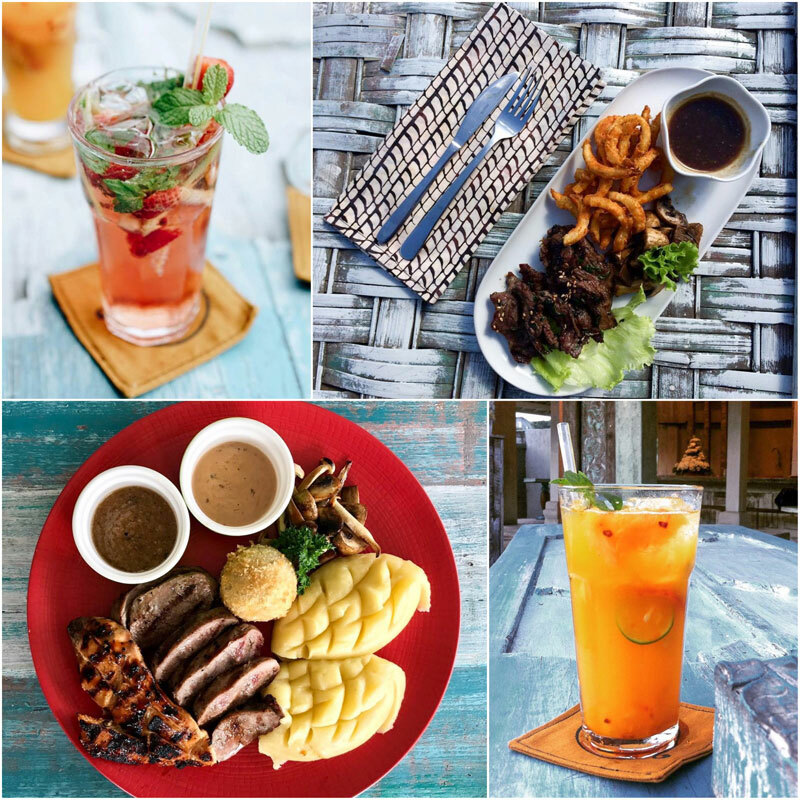 But even though missing out on their sweet treats are a crime, their savoury items are good enough to munch on and the smoothies the most refreshing. 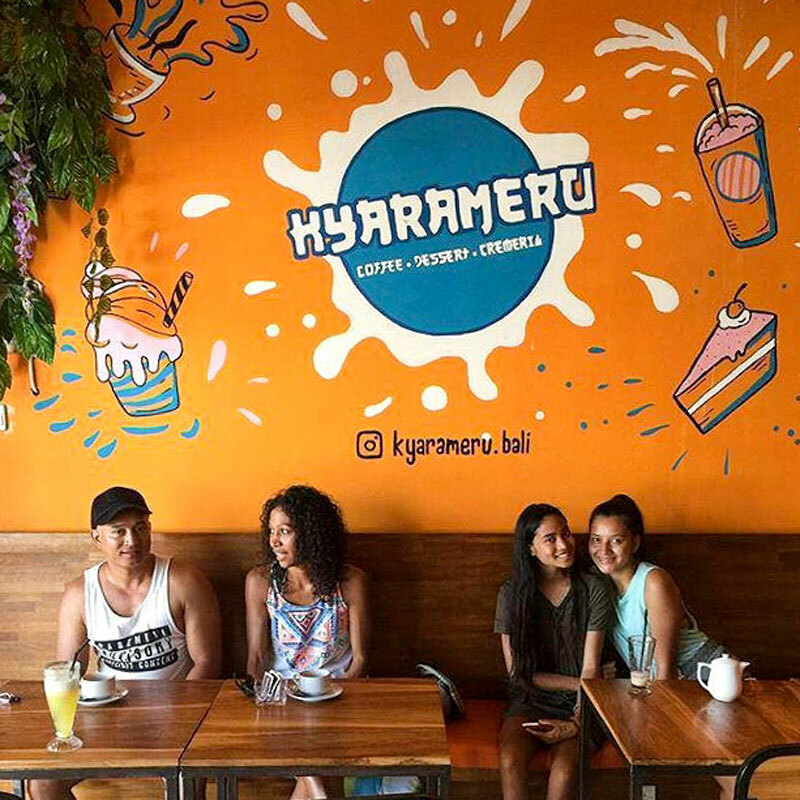 It’s the perfect place for a quick bite – starting off your Bali trip on a sweet note! Morning flights can be hell – but you can make it all better by grabbing breakfast at Crumb and Coaster. Stopping over before catching a flight, or just arrived from a long overnight flight? 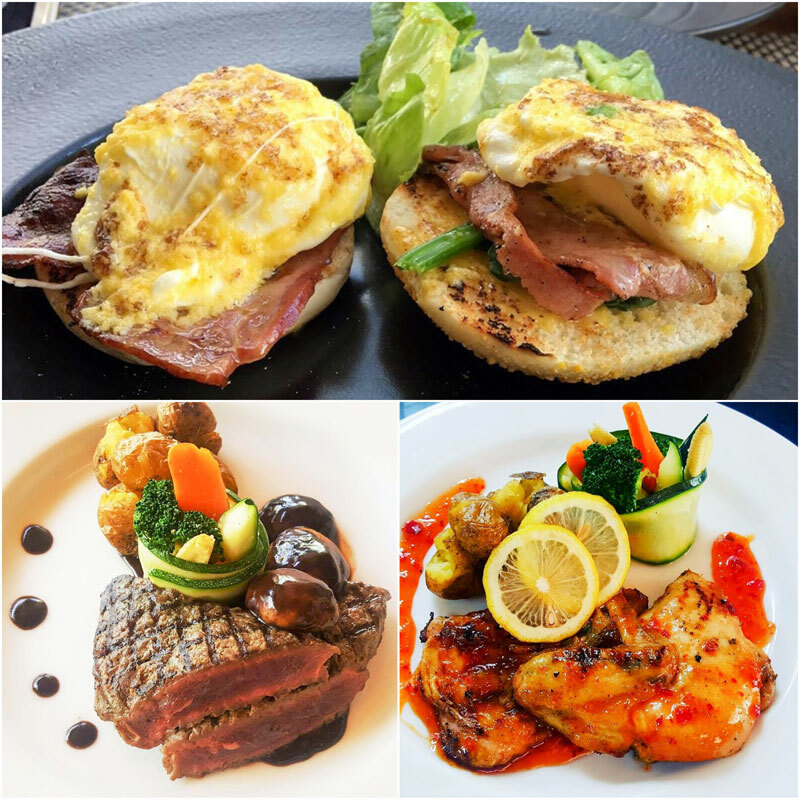 Fuel up with their all-day breakfast menu! Lover of smoothie bowls? The healthy and delicious smoothie bowls will keep you feeling light and energetic all day! Don’t mind a heavier meal? The giant burgers oozing with tasty sauces are totally drool-worthy! 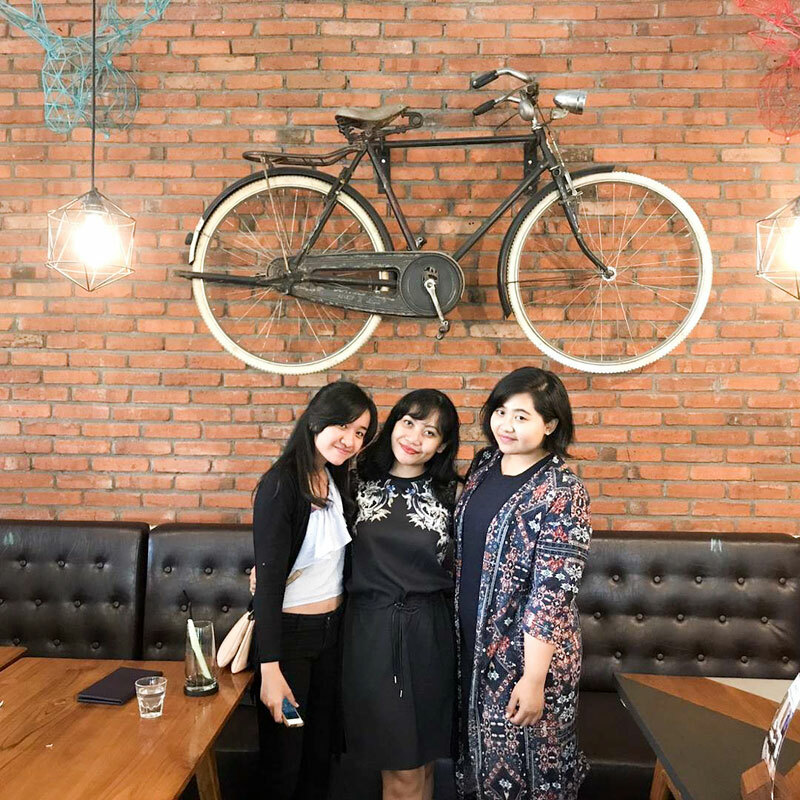 As the newest hip and happening place in Kuta’s very own touristy circle, Crumb and Coaster can’t be more in tune with the latest cafe trends. 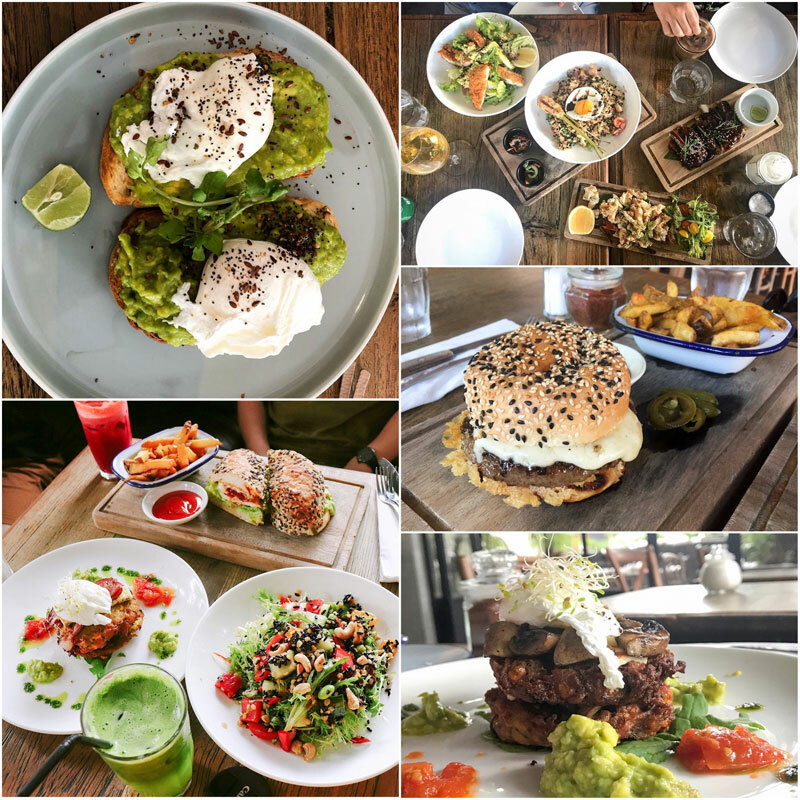 Snazzy interiors, perfect pictures, and even vegan and gluten-free options are all available here – everything you could possibly need. Got more than a few hours to spend? Perhaps waiting to meet someone before you head off to an adventure trip? 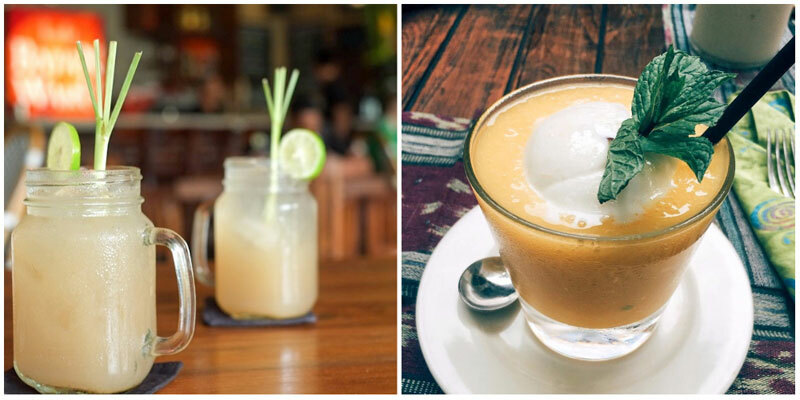 Watch the world zip by as you chill at this zippy cafe and restaurant in the Legian area. Get treated to world-class hospitality, flavourful Balinese fusion cuisine and an uber modern ambience that makes you lose track of time. 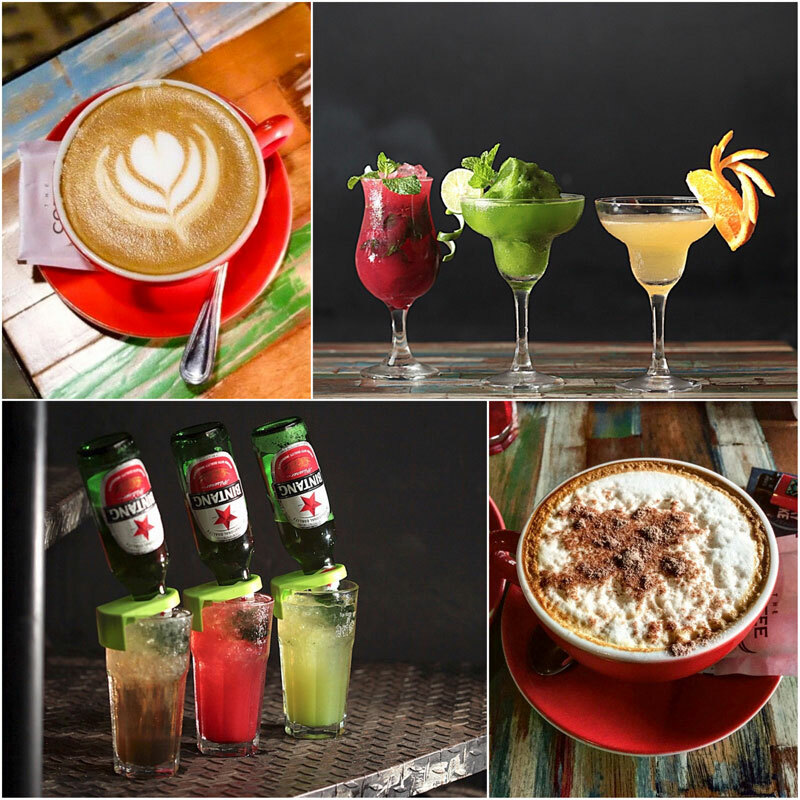 Hit the bar for some lip-smacking cocktails or just sip on some great coffee. Their refreshing cold beers are definitely recommended too. 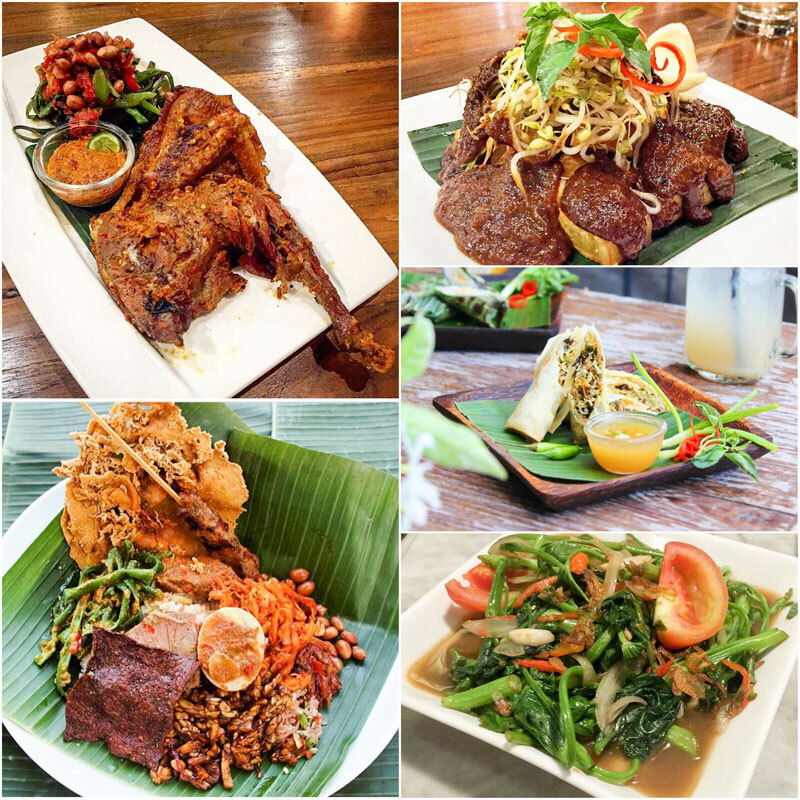 We’re not forgetting the Nasi Campur, a delicious hunger satiator! Still craving for more? 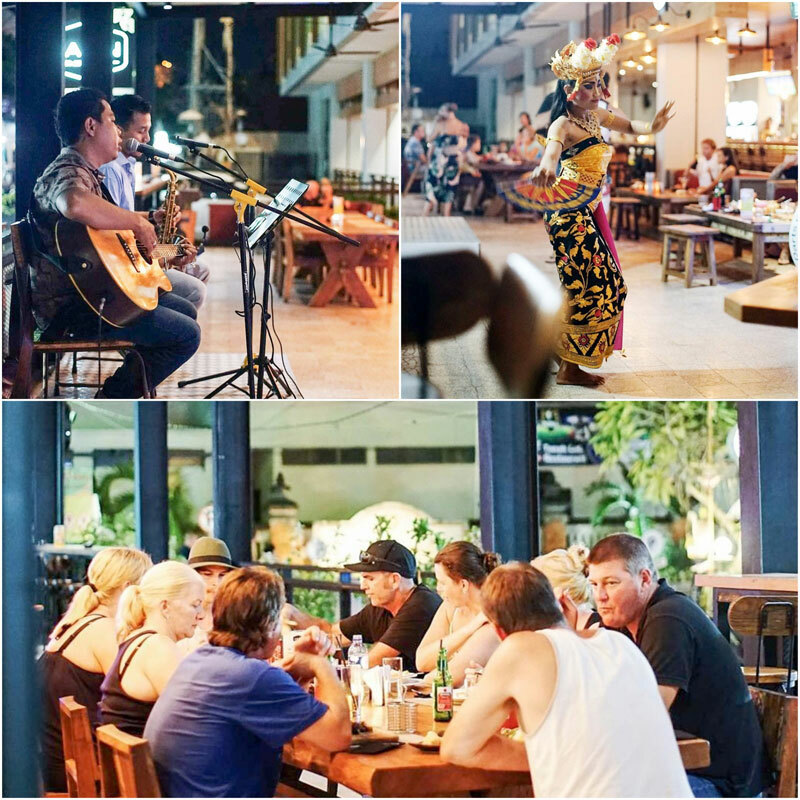 Night time is extra lively with some live acoustic tunes to accompany your drinks. And if you are lucky enough to arrive on a Friday night, give your senses a treat with a traditional Balinese dance performance! Love the beach, adventures and big breakfasts? 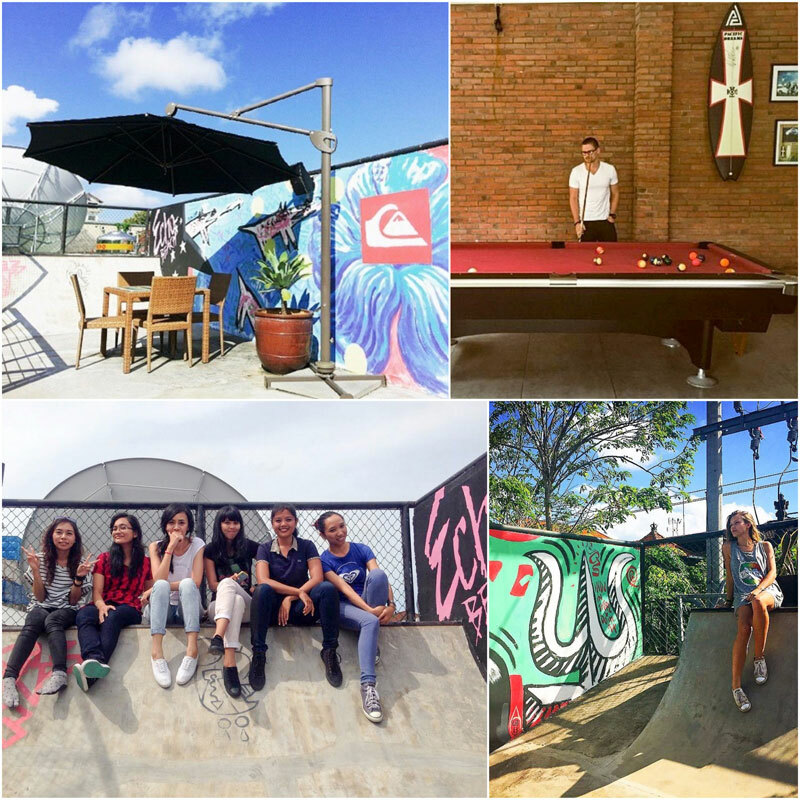 The Boardriders Cafe is the right place for you! 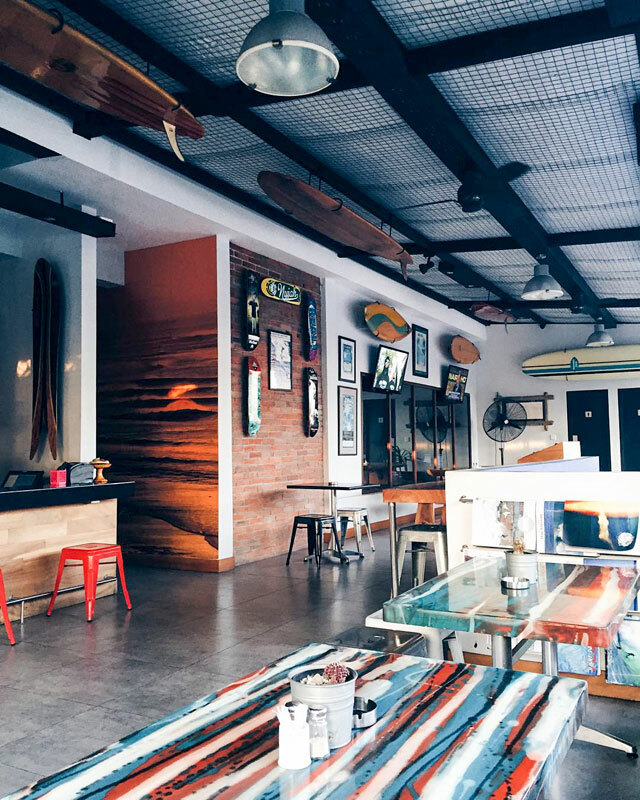 This funky-cool cafe brings out the beach vibes with beach waves on the walls and ocean blue hues. 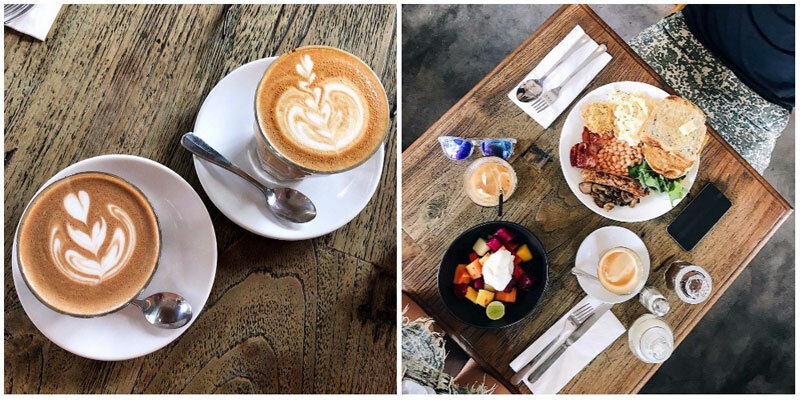 Grab a filling Aussie-style breakfast and buy yourself a surfboard from the shop here – that should get you into full on beach-mode. Find your regular look a little boring? Score a beer and also a new haircut because the cafe also has a barber shop! 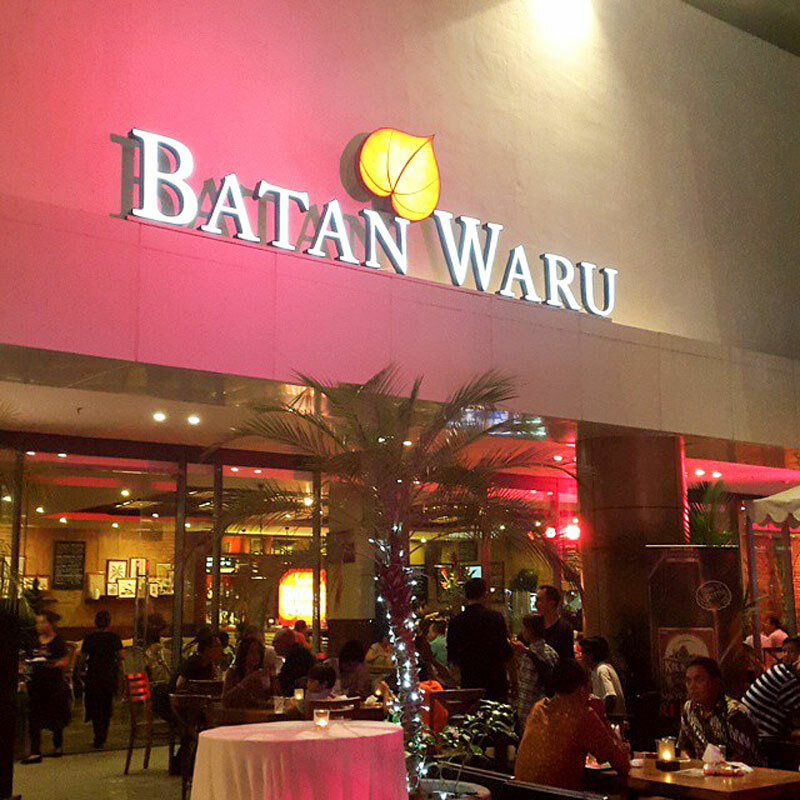 Spend a good time with your mates at the open balcony seating or playing pool. You can come with a large group or turn up solo to do some soul searching – but you’ll definitely find a lot to do at the Boardriders’. 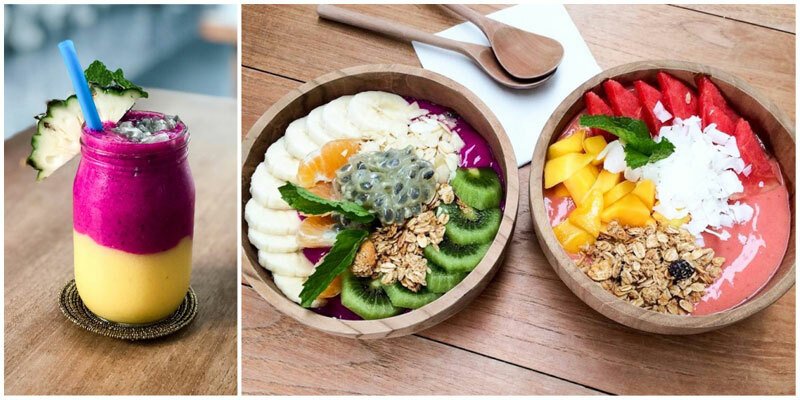 If you arrive right in time for breakfast, get the Surfer’s Big Breakfast or the Surfers Bowl loaded with fruits. Got a sweet tooth? The cakes are absolutely to love! 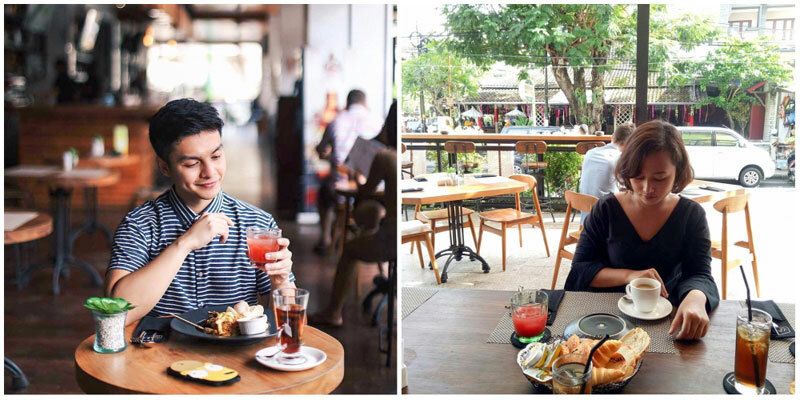 Would you prefer to chill at a cafe before or after your flight? And which is more important to you – proximity to airport, wifi, good food, good ambience, affordable food or any other factor? A twenty-something girl in the city who gave up a perfectly good career in Business Law to become a writer and a musician on the go! When I’m not busy writing my heart out or figuring out the next chord on my guitar, you’ll find me planning my next trip across the world. I believe that the only true belonging you have is the journey you choose to take.